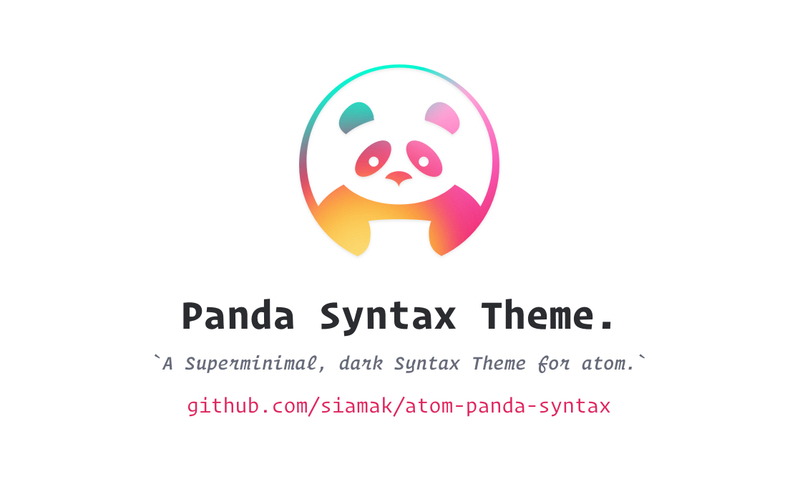 The last syntax theme you’ll ever download. 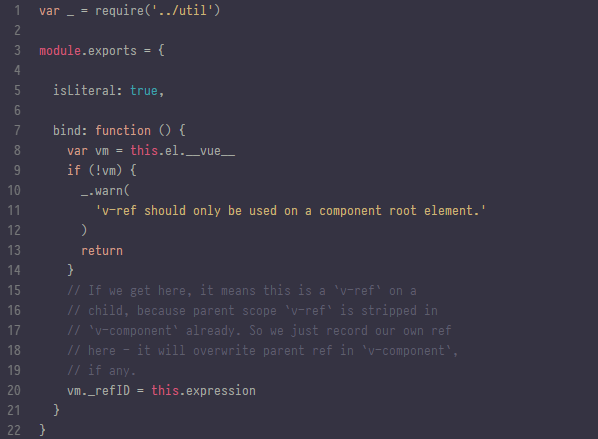 A dark syntax that’s easy on the eyes. 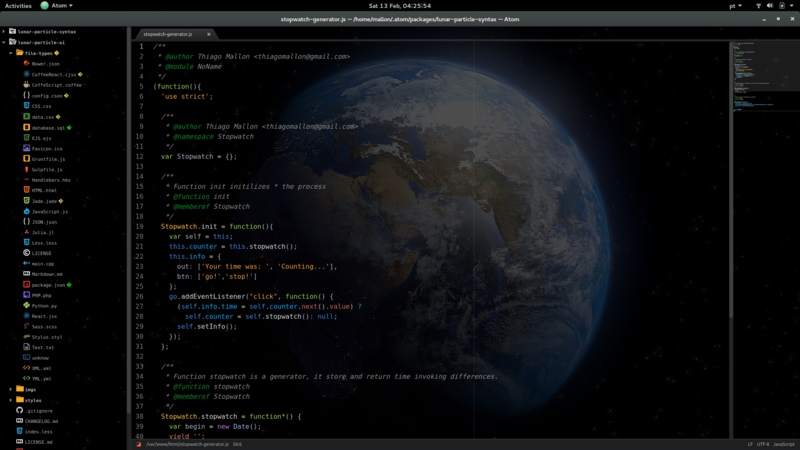 A port of Dayle Rees’ “Peacocks In Space” theme for Sublime. 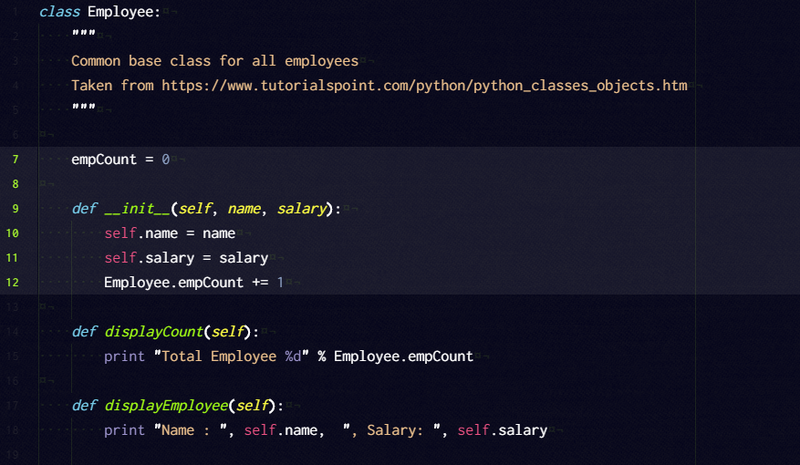 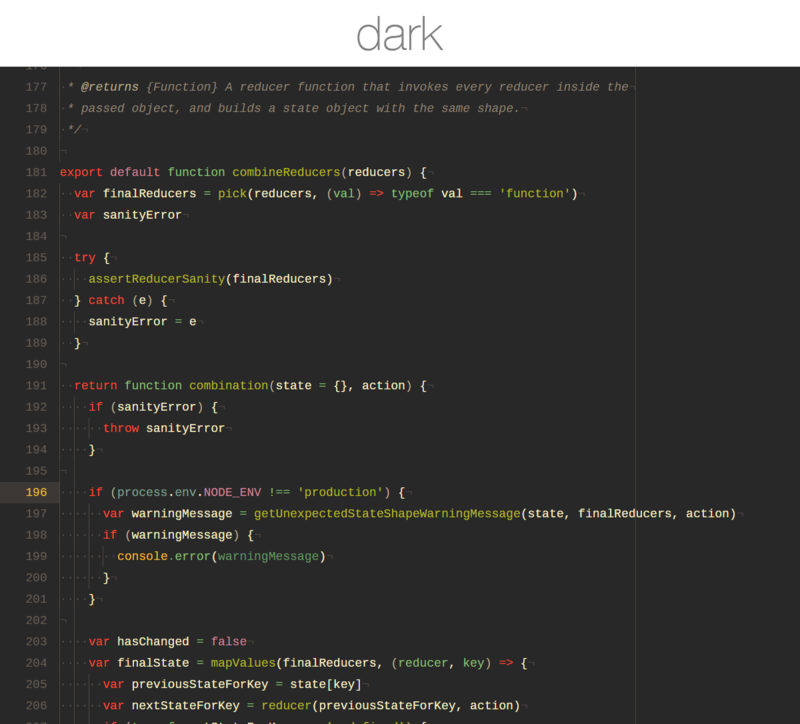 A dark syntax that’s easy on the eyes for the Material UI. 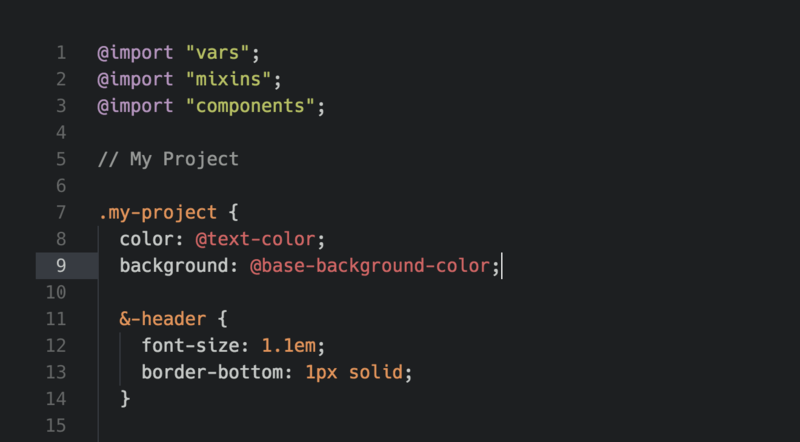 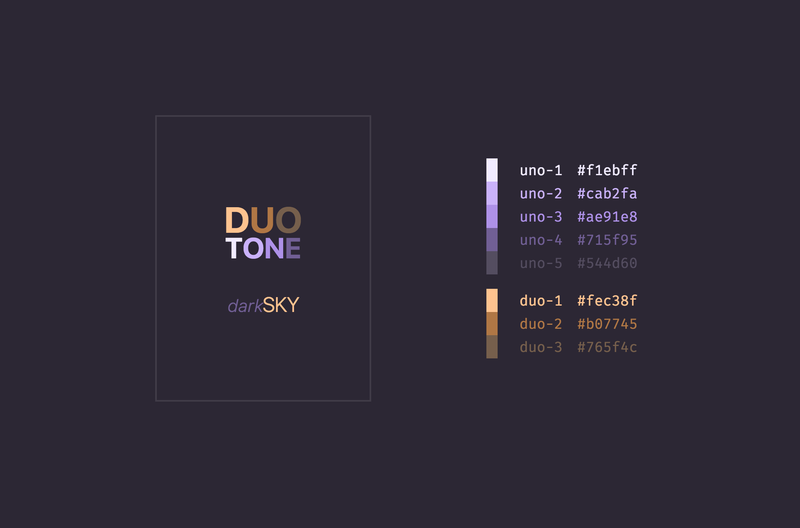 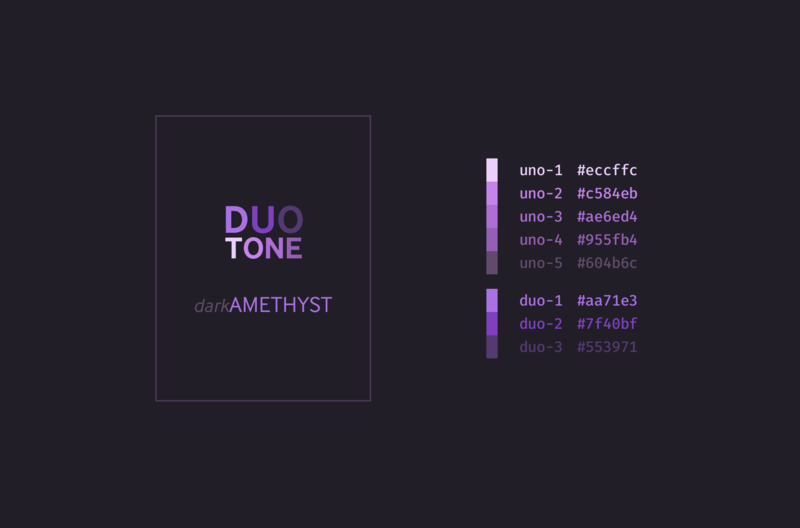 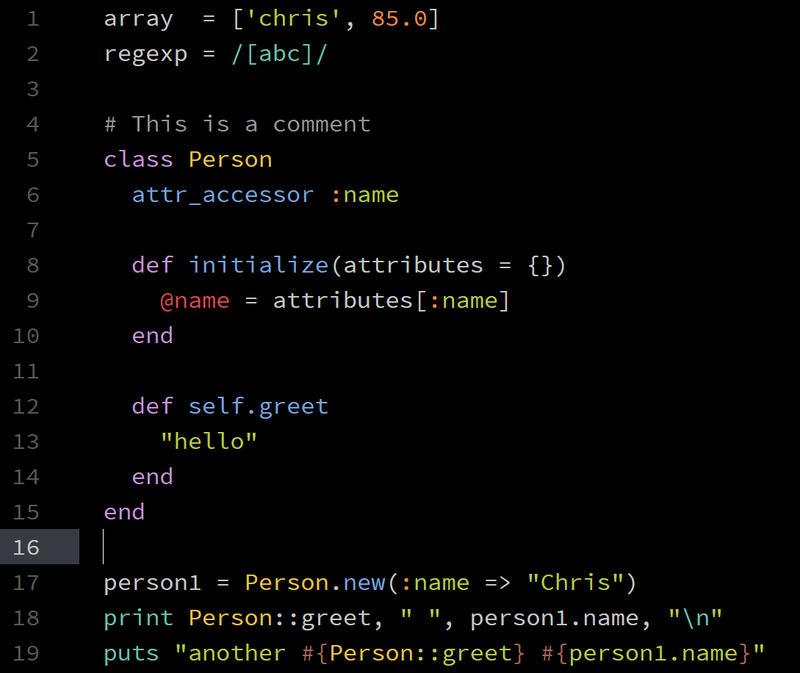 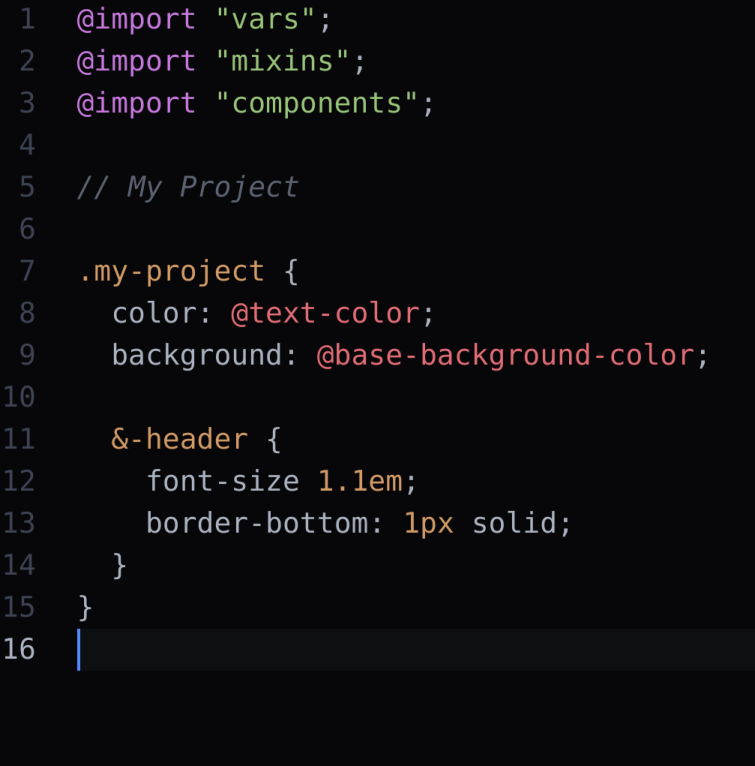 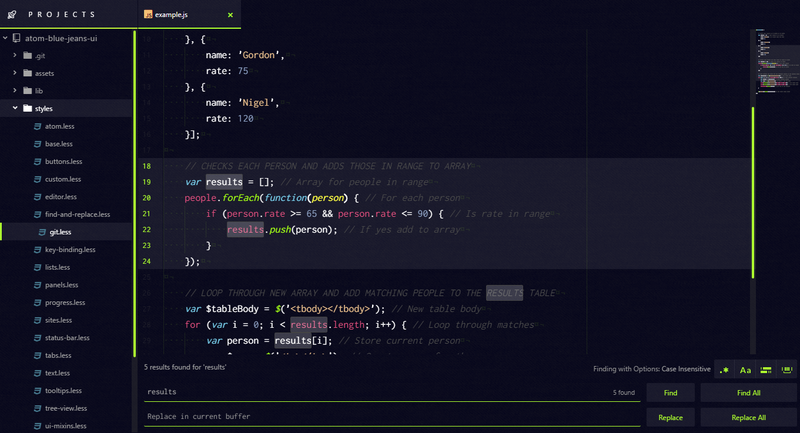 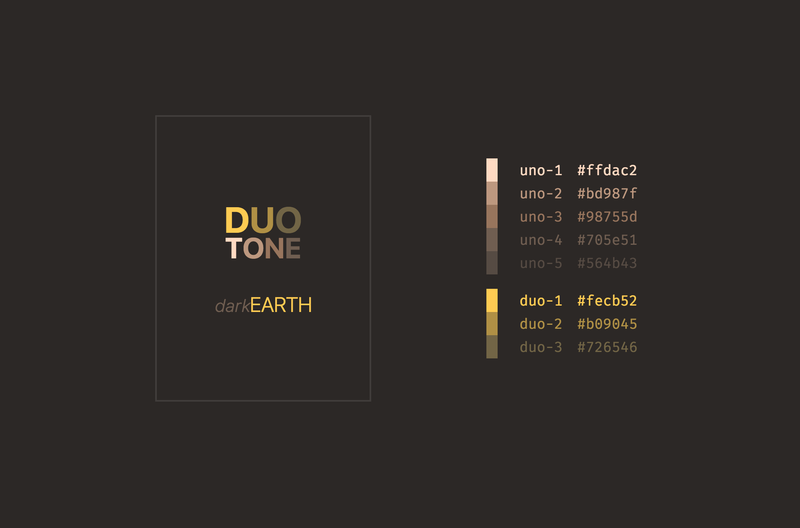 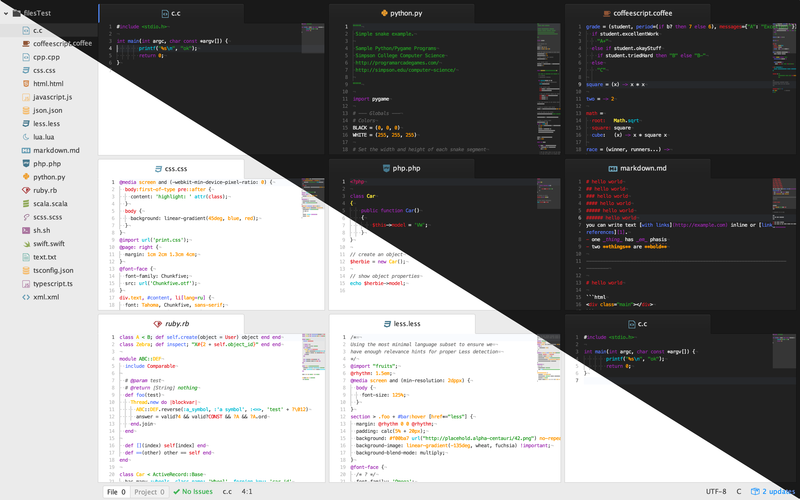 A fork of atom’s ‘One dark syntax theme’, but using a material colour pallet. 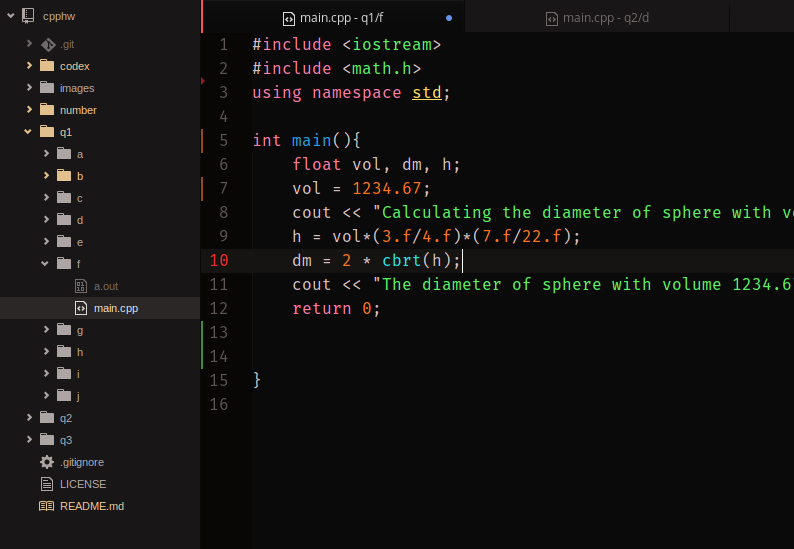 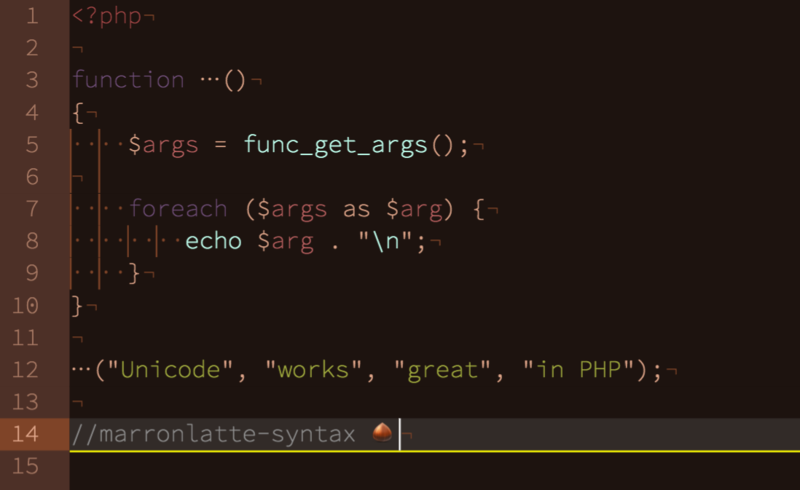 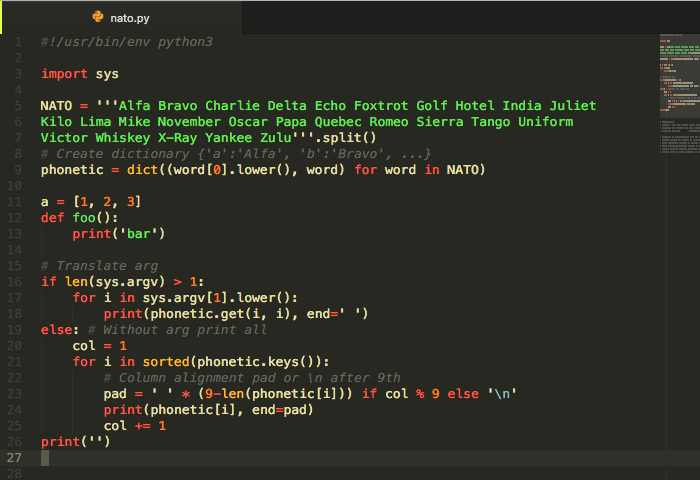 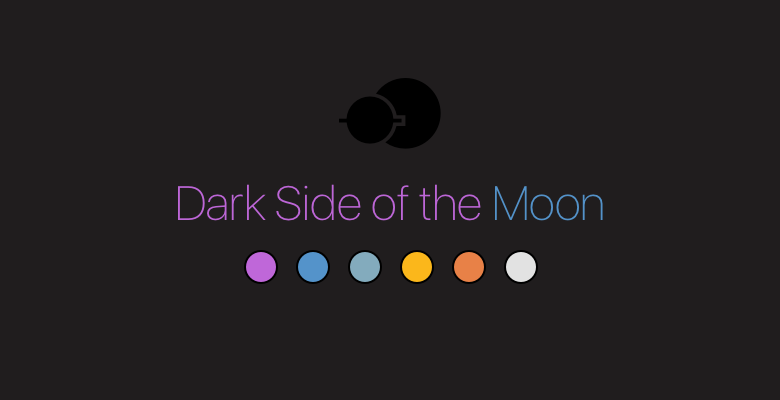 This syntax theme inspired by the colors of Saturn’s largest moon. 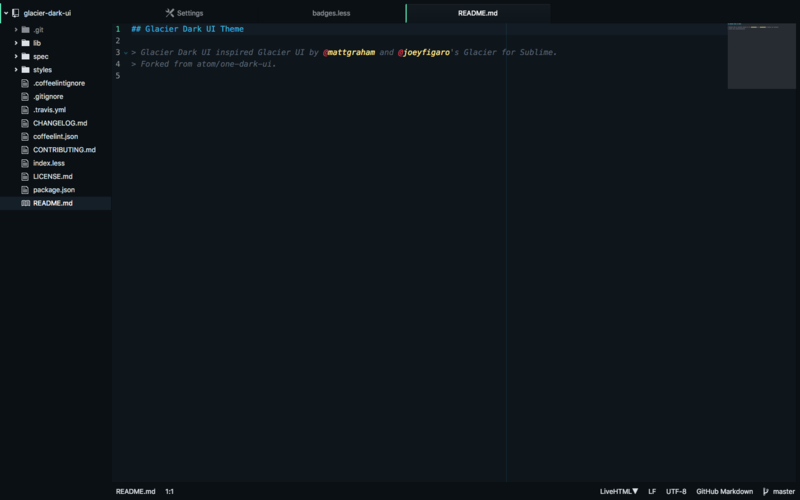 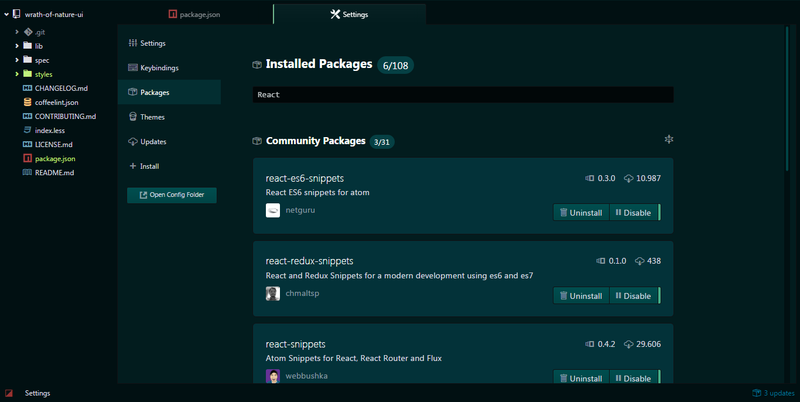 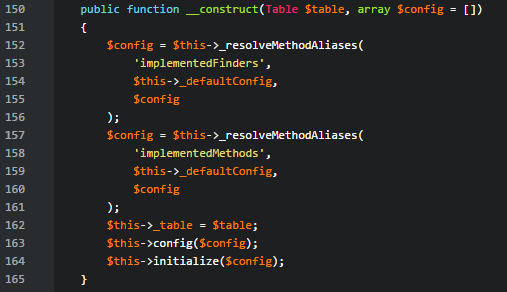 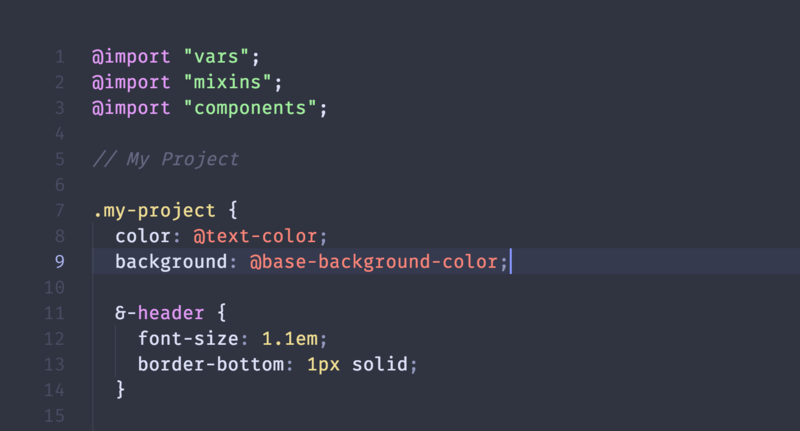 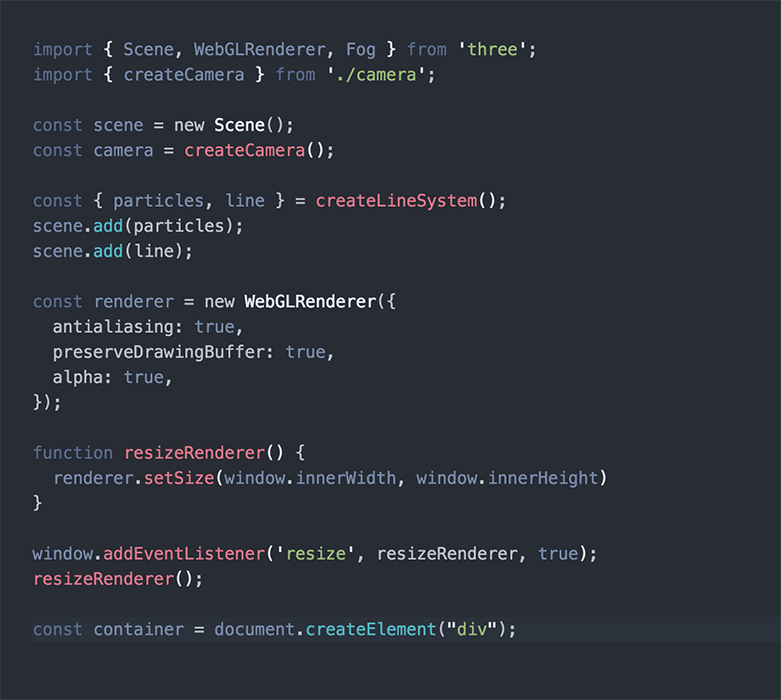 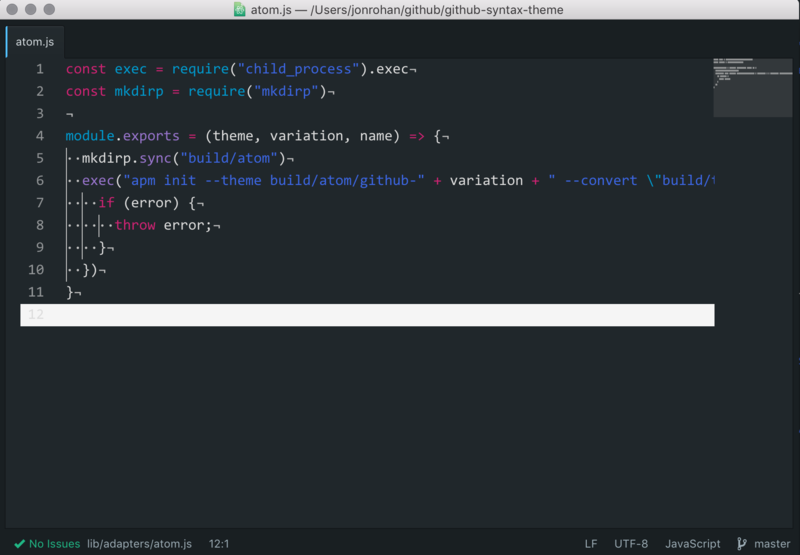 Thanks to Atom’s One Dark theme for structural inspiration! 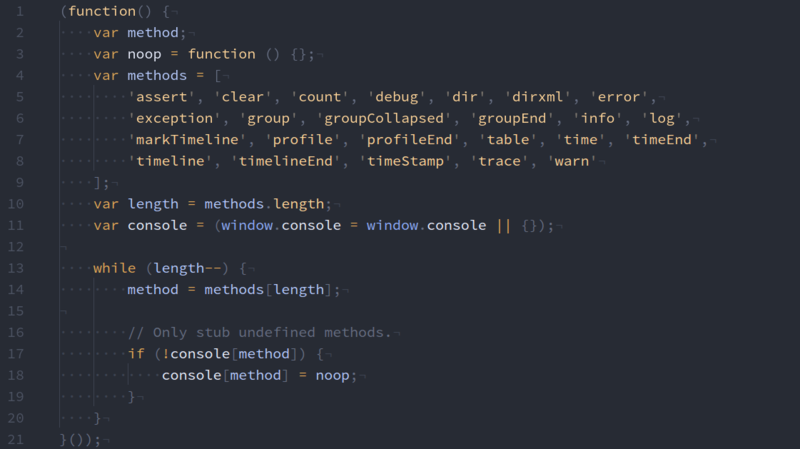 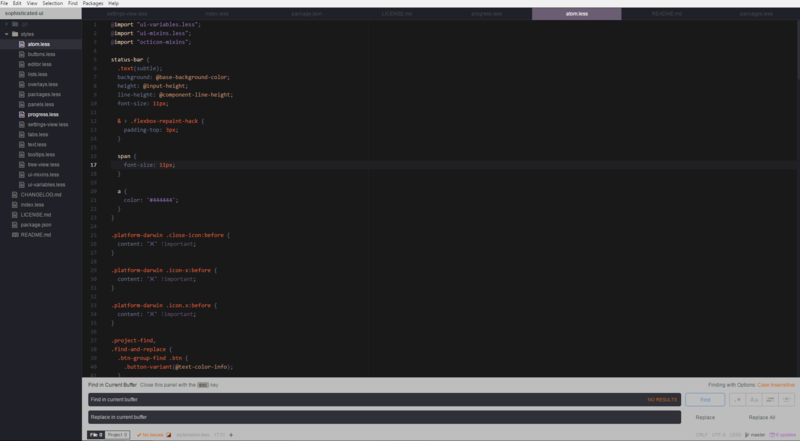 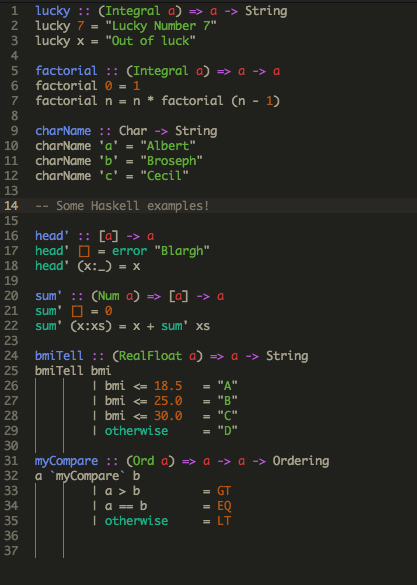 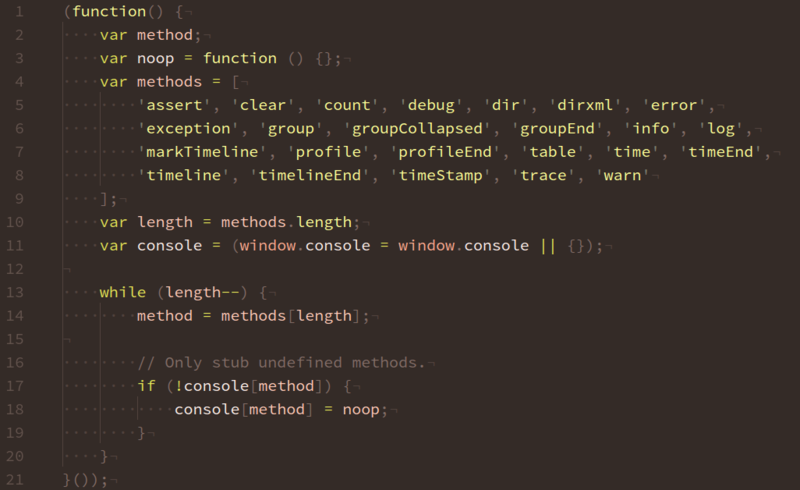 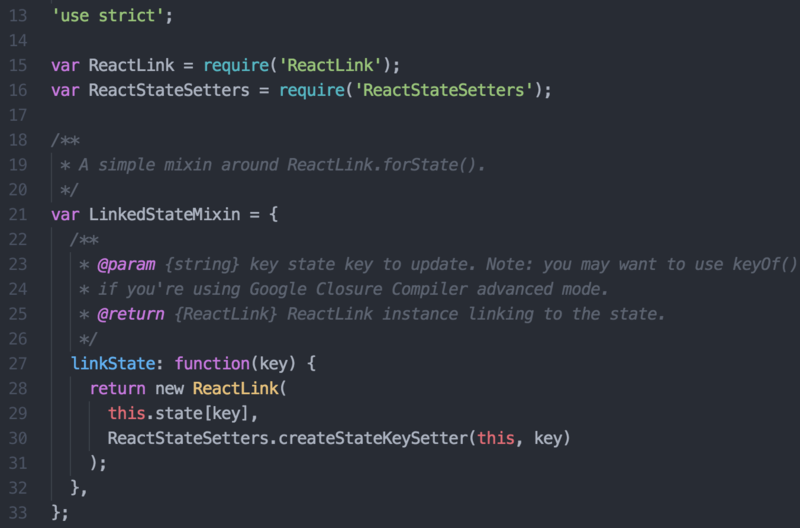 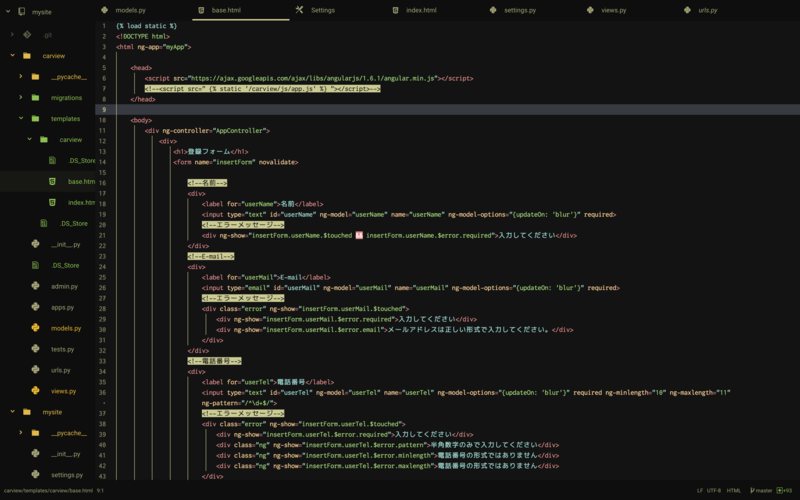 A distictly refined “Monokai”-flavored syntax theme, inspired by Sublime Text. 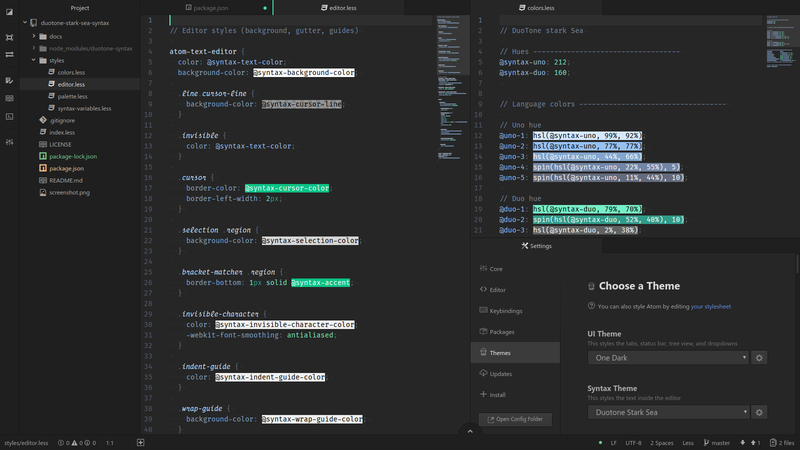 A ‘gharelu’ syntax theme - dark edition. 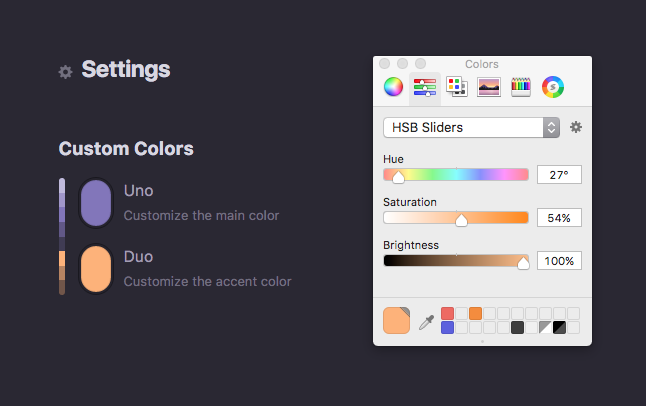 Plain elegant, unobtrusive interface featuring configurable, adaptive color palette. 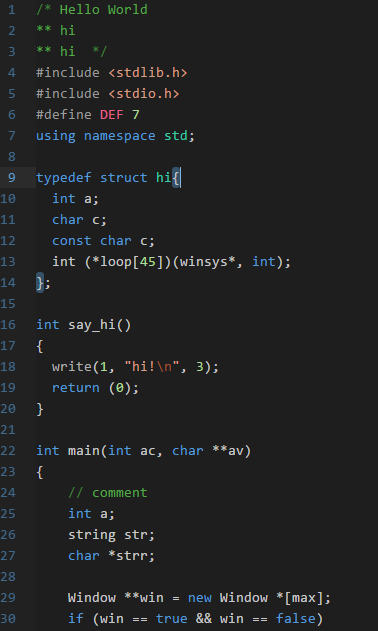 It’s like having a cake and eating it too. 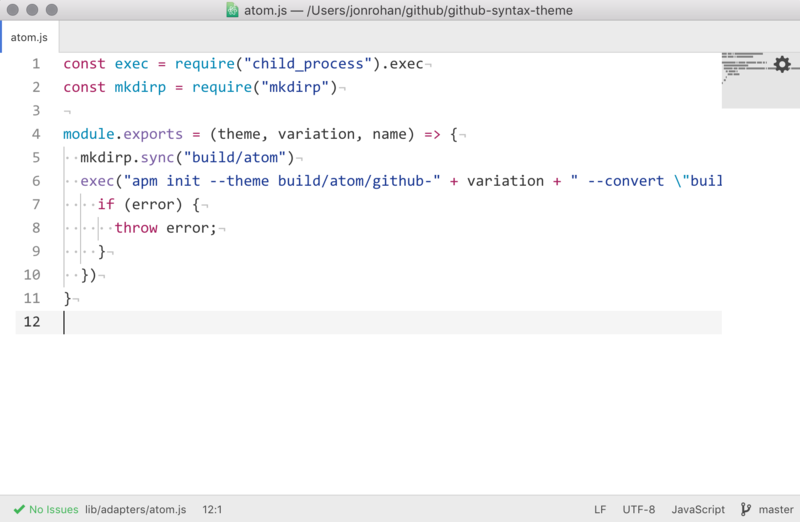 Atom.io theme that’s a blend between function and design. 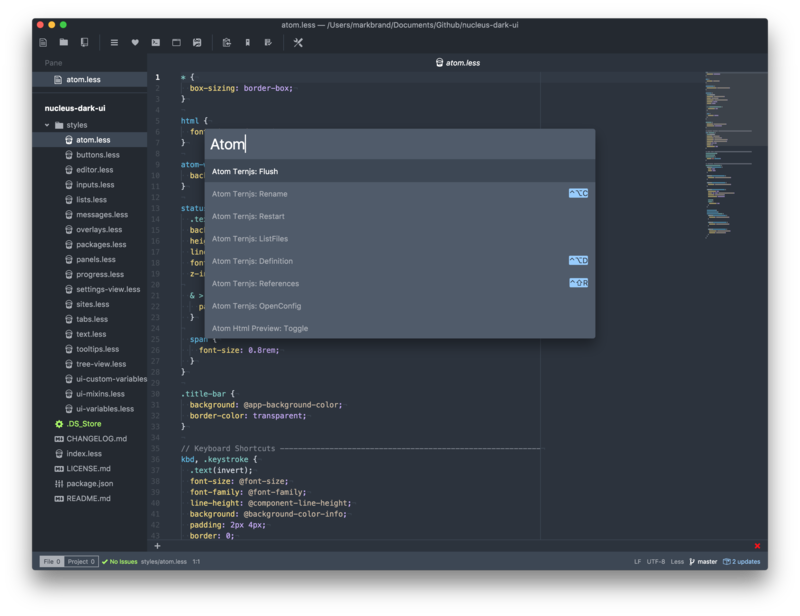 An Atom UI theme for people who appreciate minimalism. 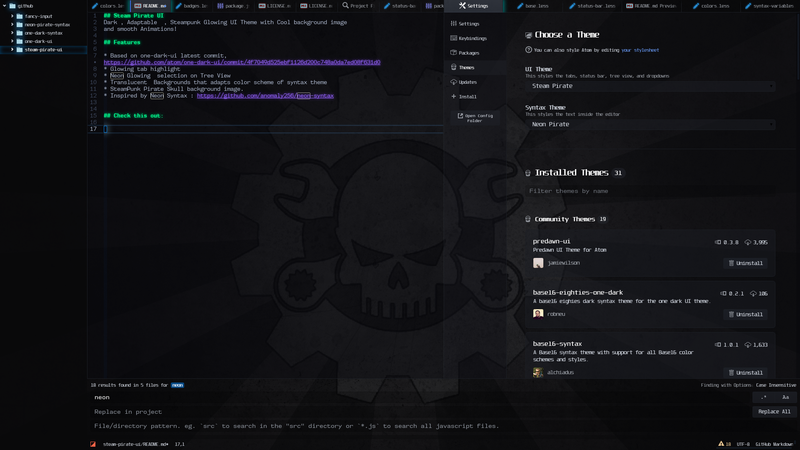 Based on ignism’s Nucleus Dark UI. 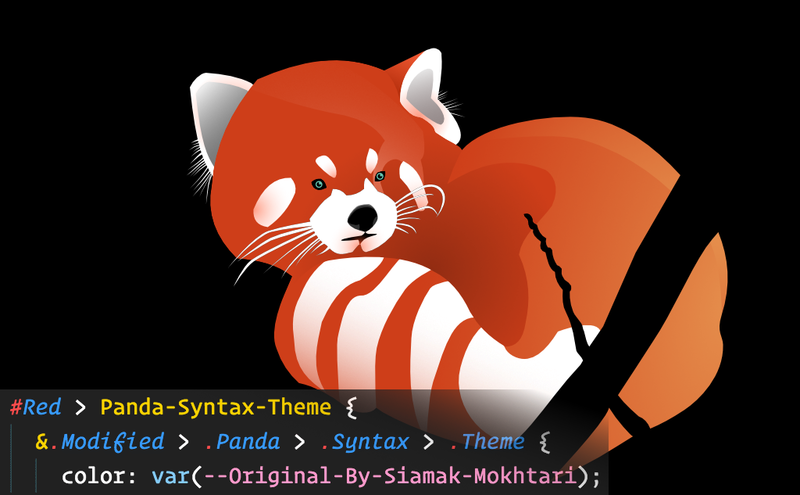 Nature vulcano syntax theme is a fork of One-dark-syntax with “fire” colors affinities. 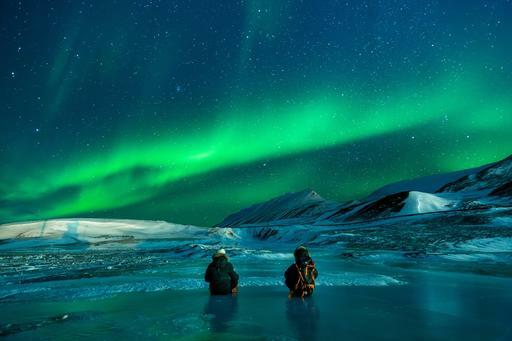 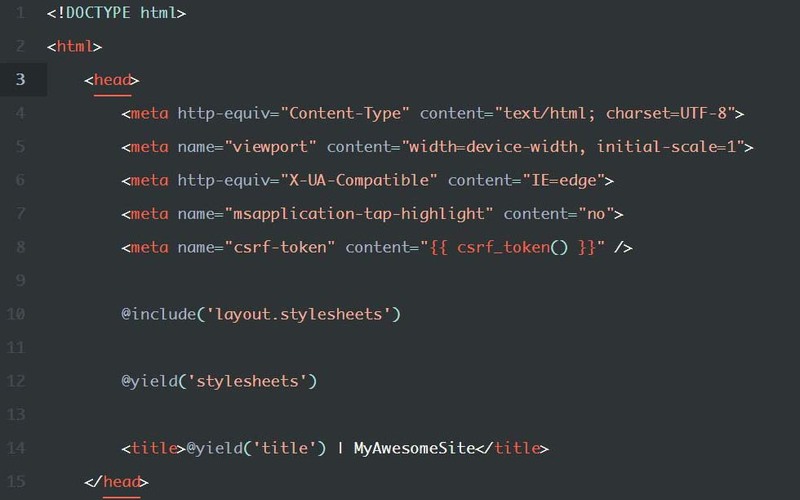 All credits for it. 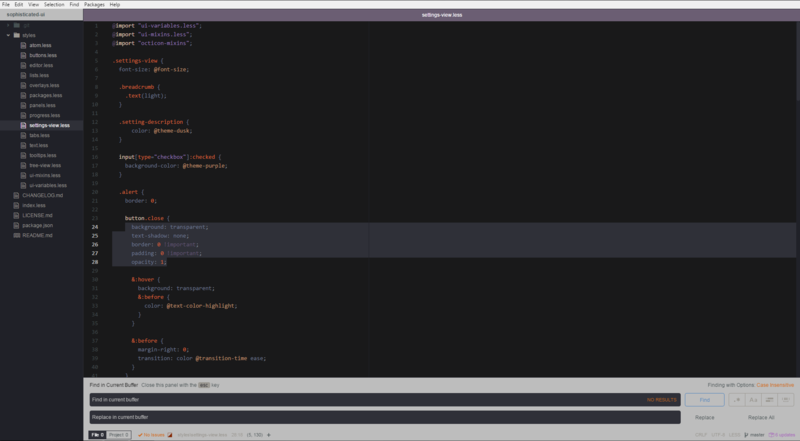 Theme for Atom inspired by JetBrain’s Darcula theme. 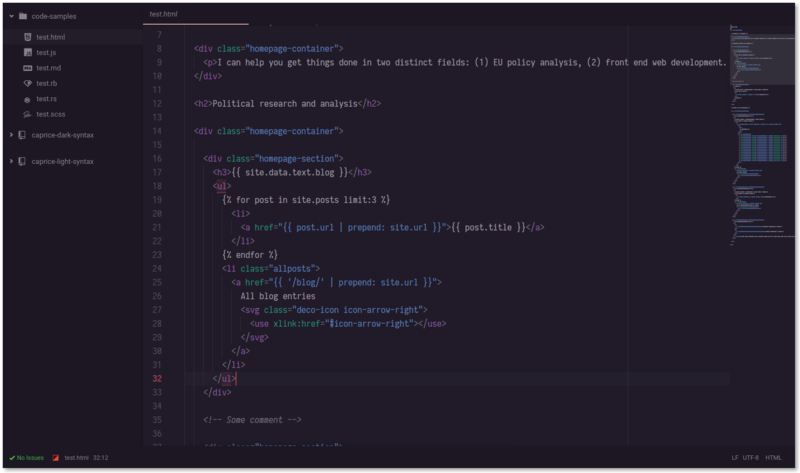 A modern and refined UI-theme for any dark syntax theme, featuring custom styling for a variety of popular Atom packages. 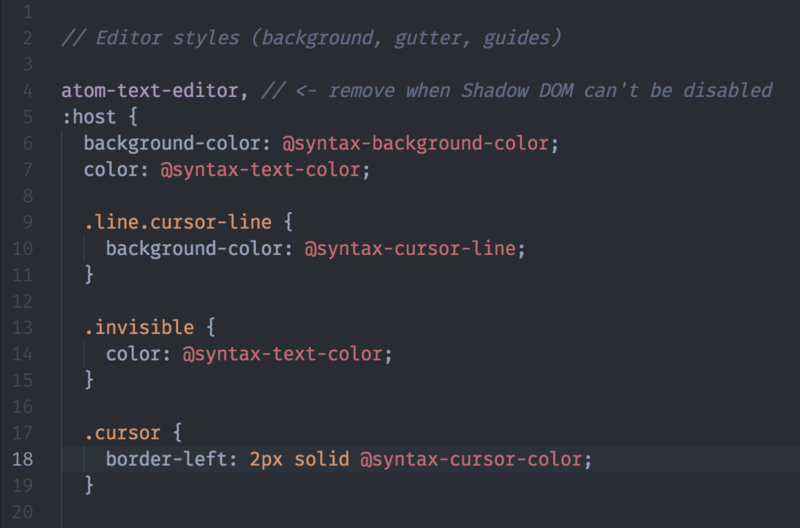 A dark material design syntax theme with a good contrast and vibrant pops of colors. 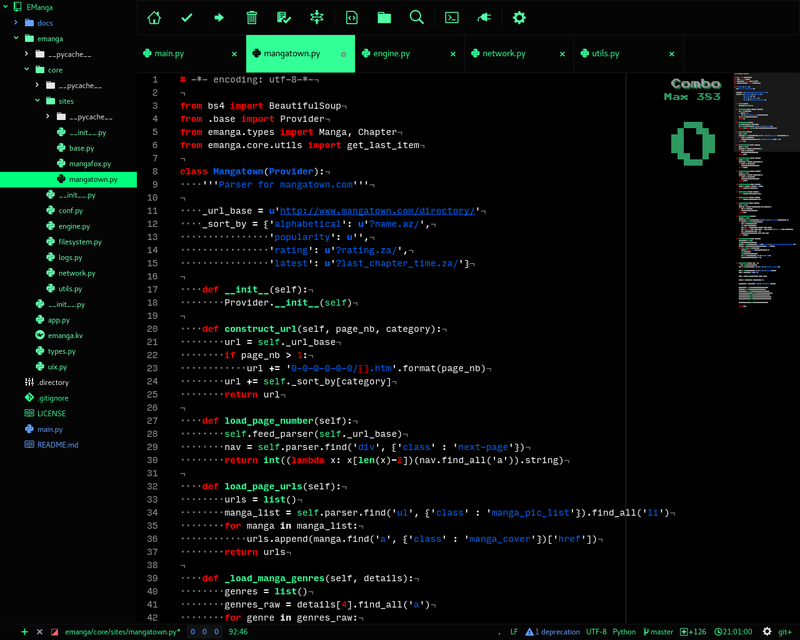 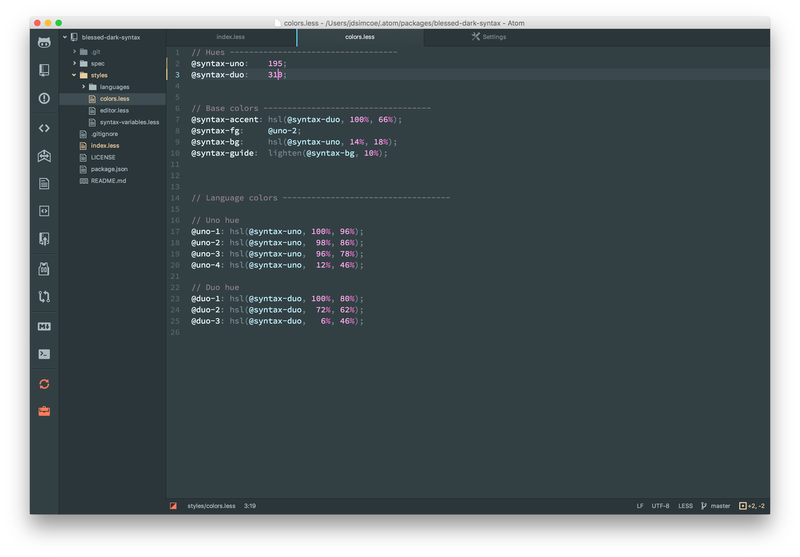 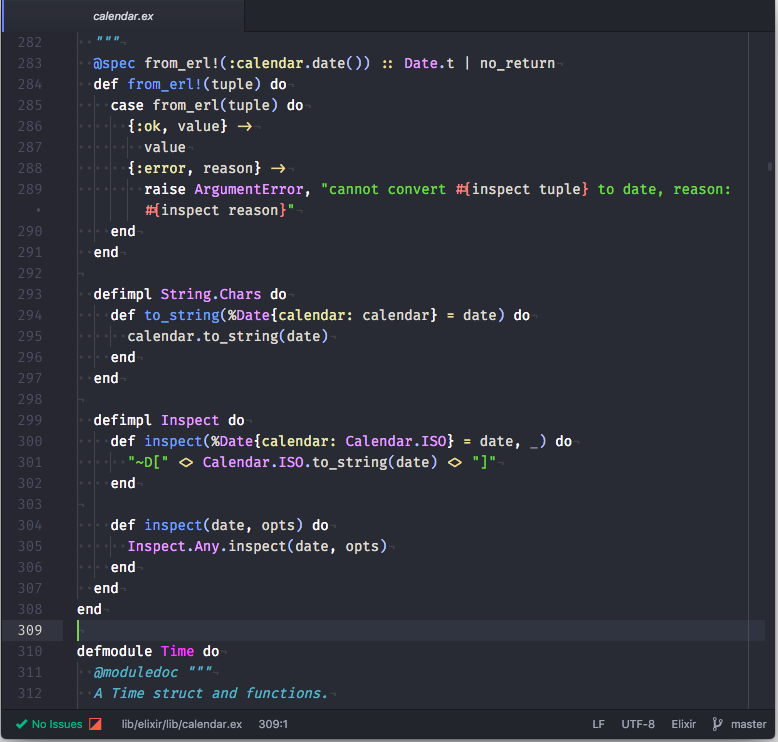 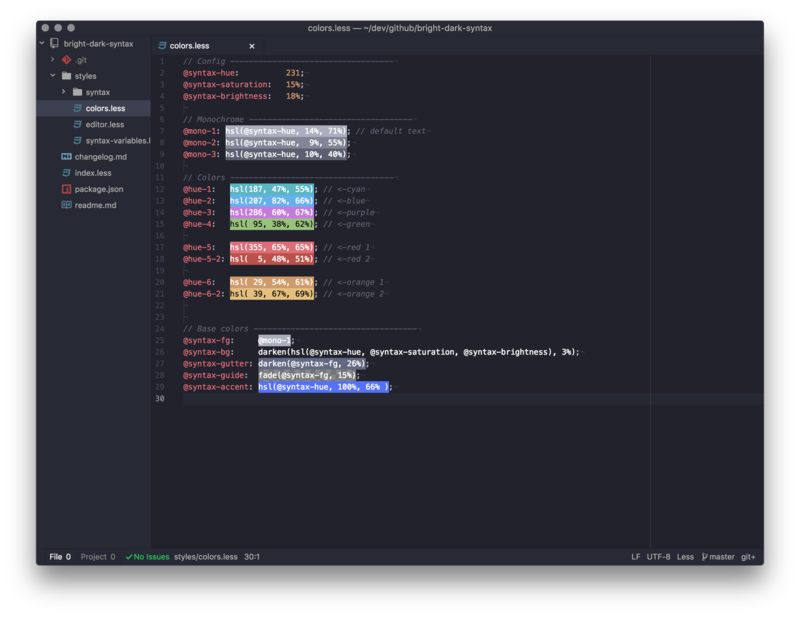 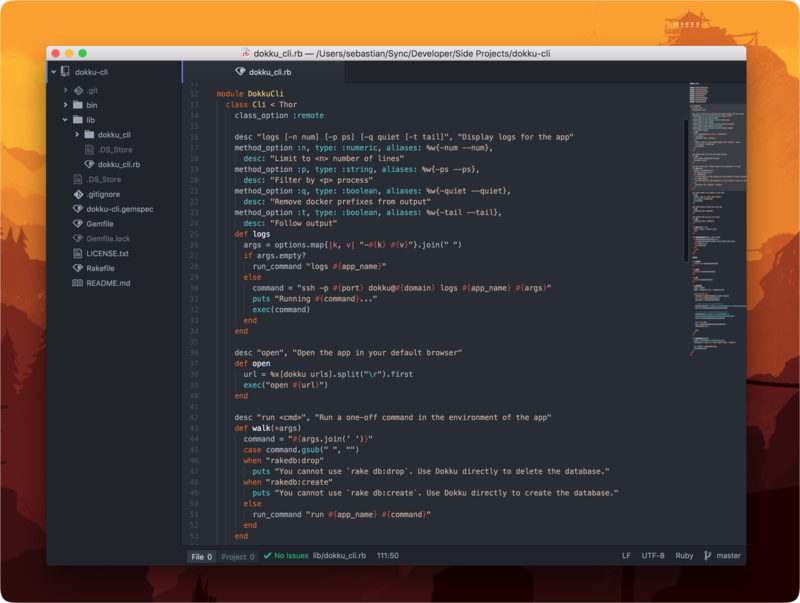 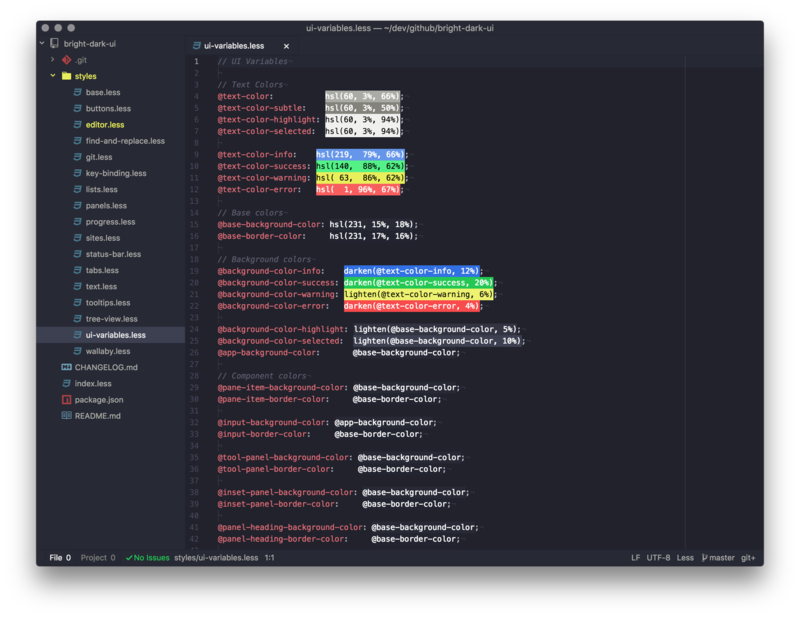 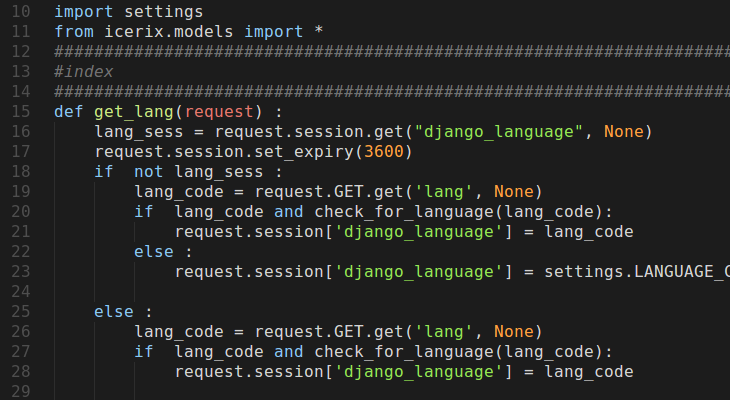 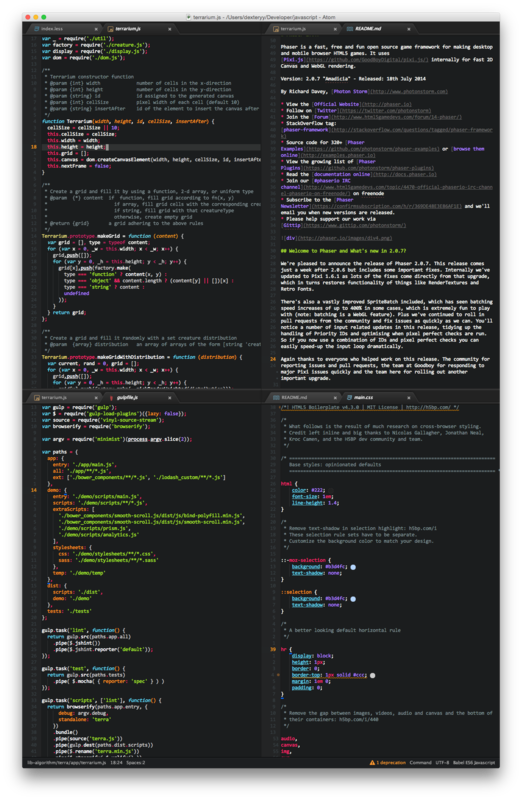 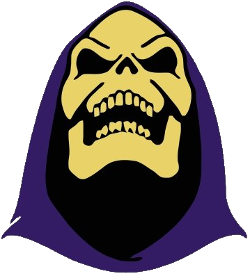 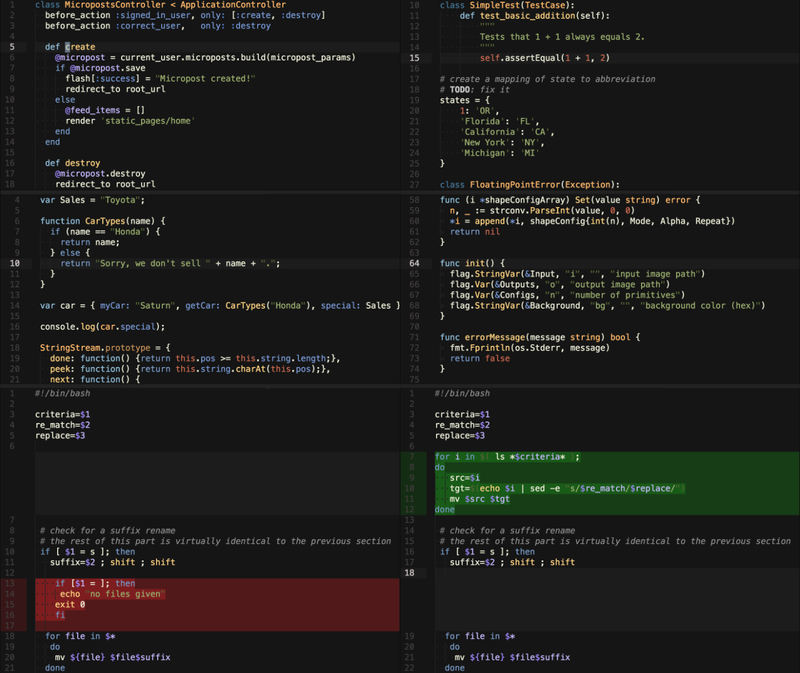 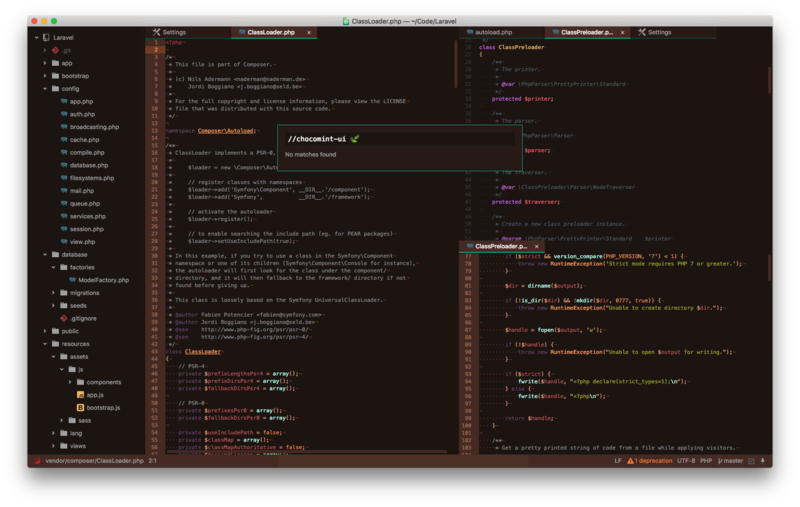 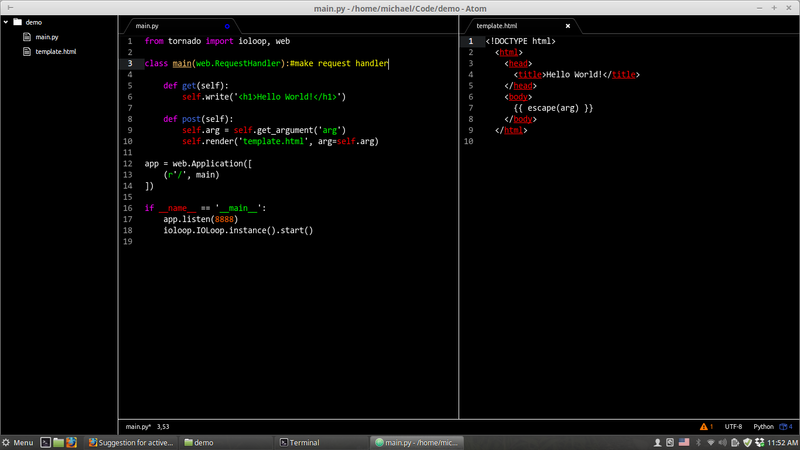 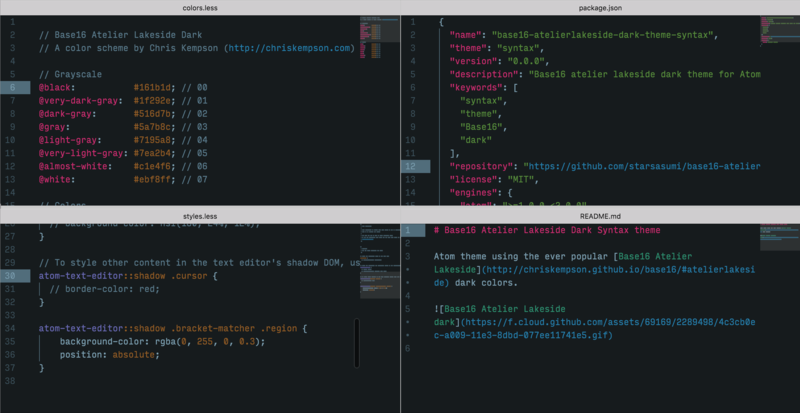 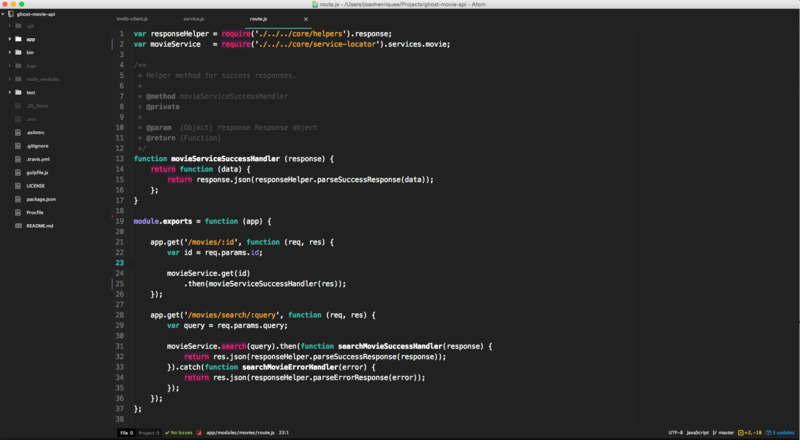 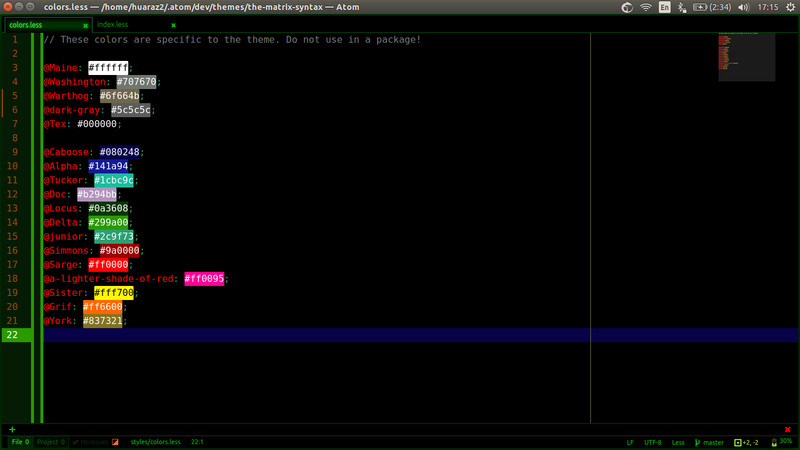 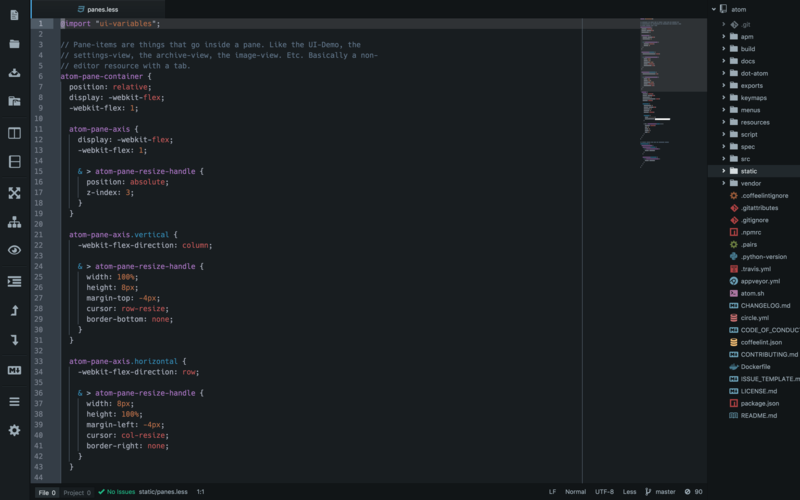 This is an atom adaption of one of my all time favorite themes, Spacemacs Dark for Emacs. 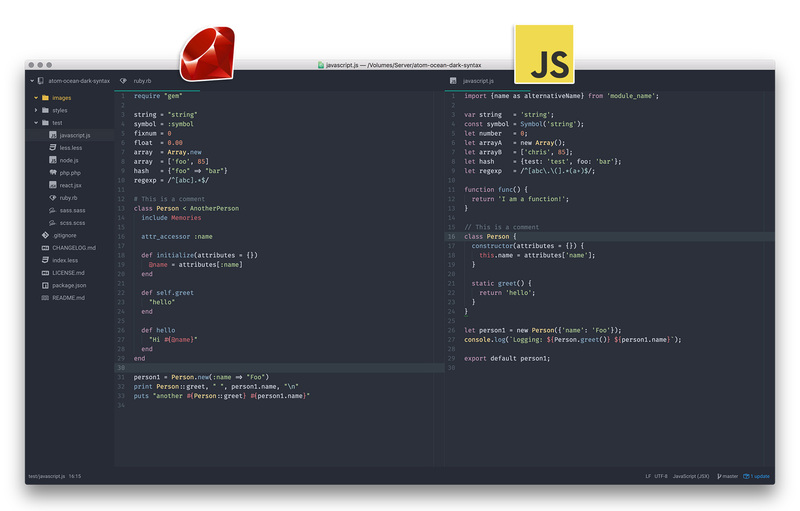 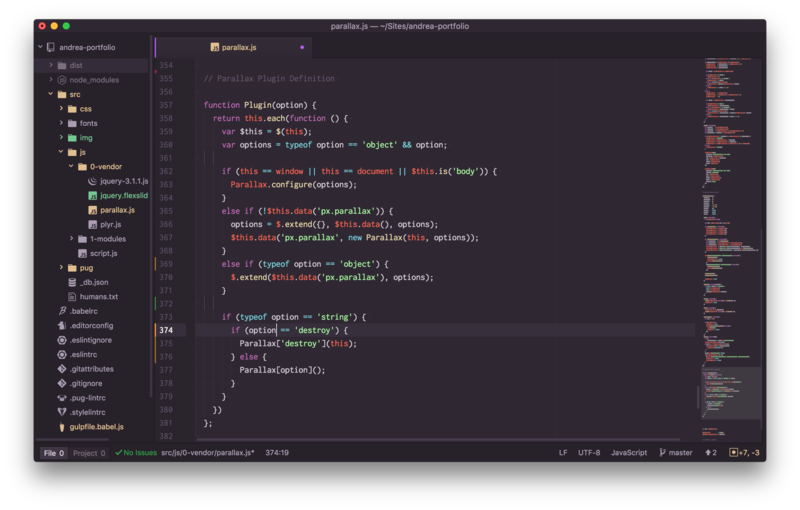 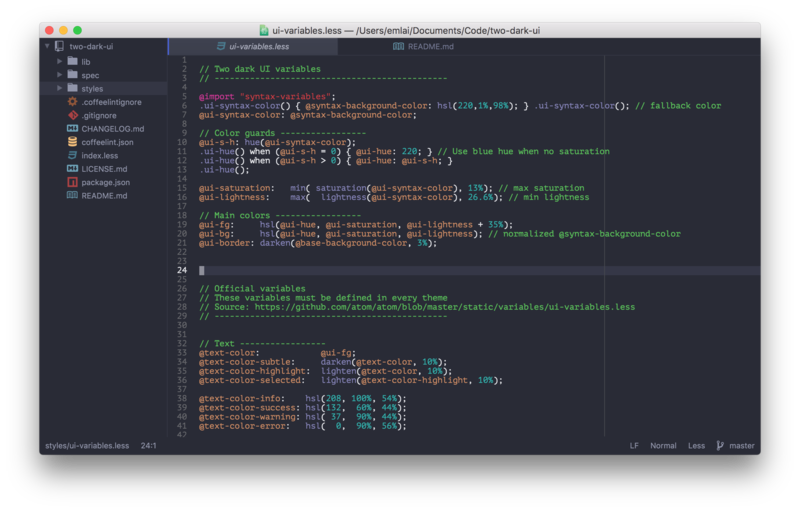 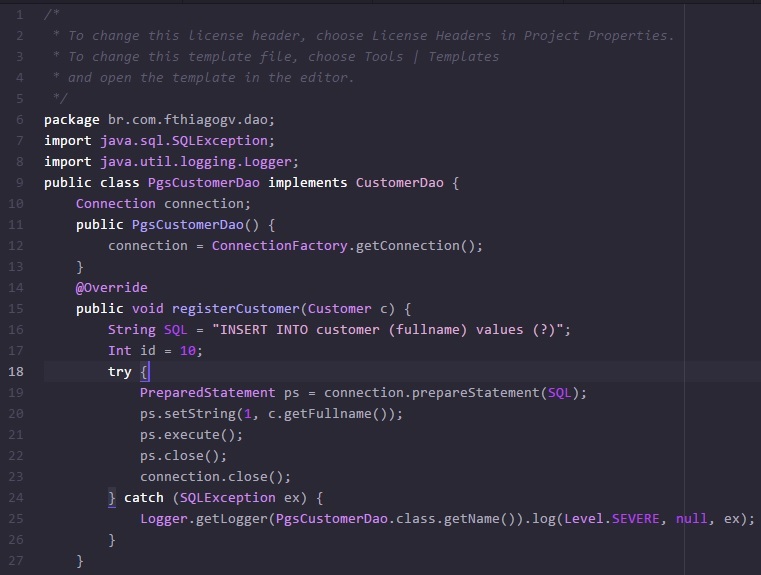 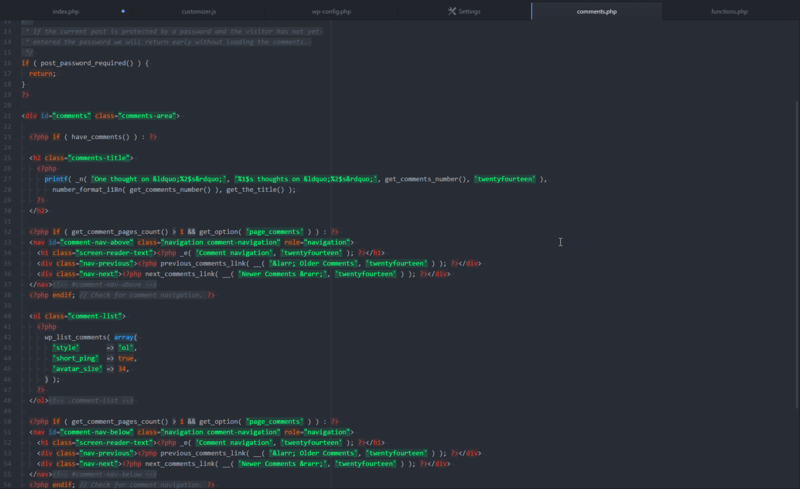 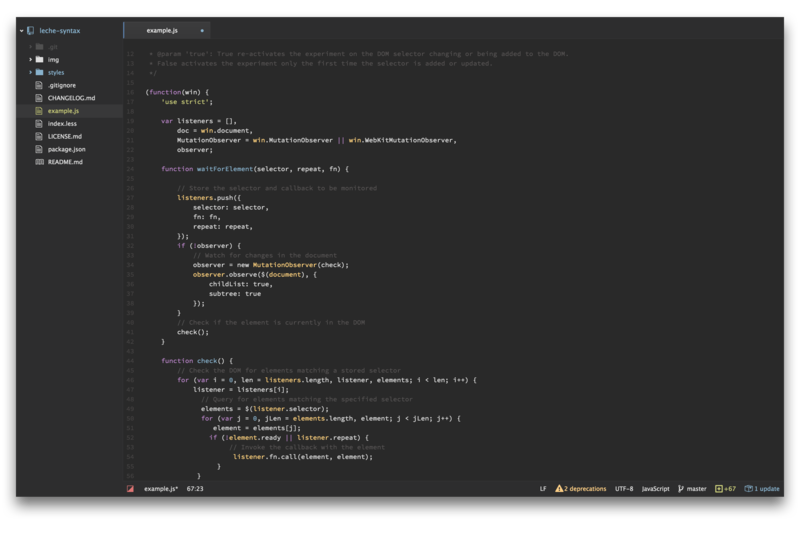 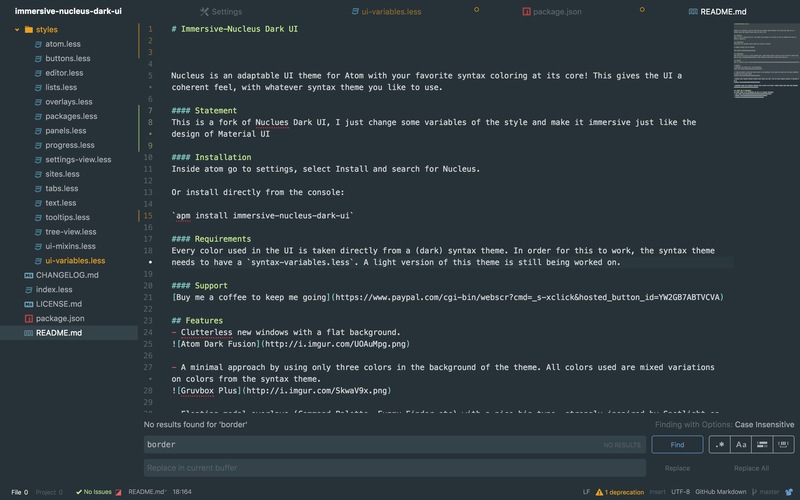 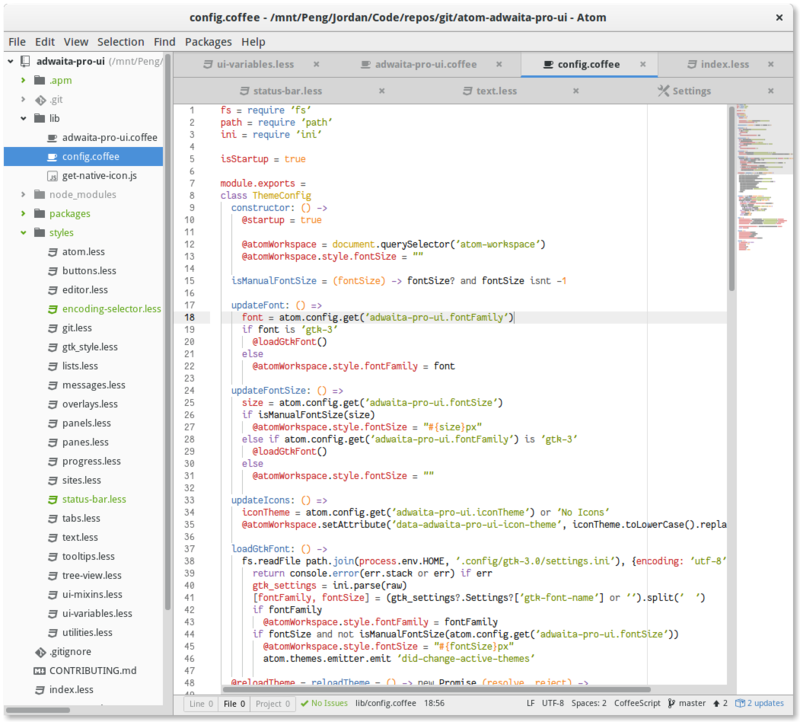 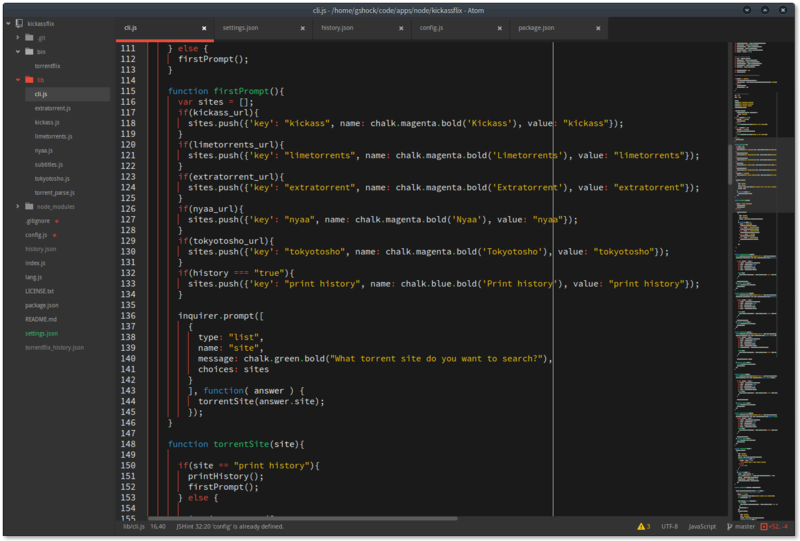 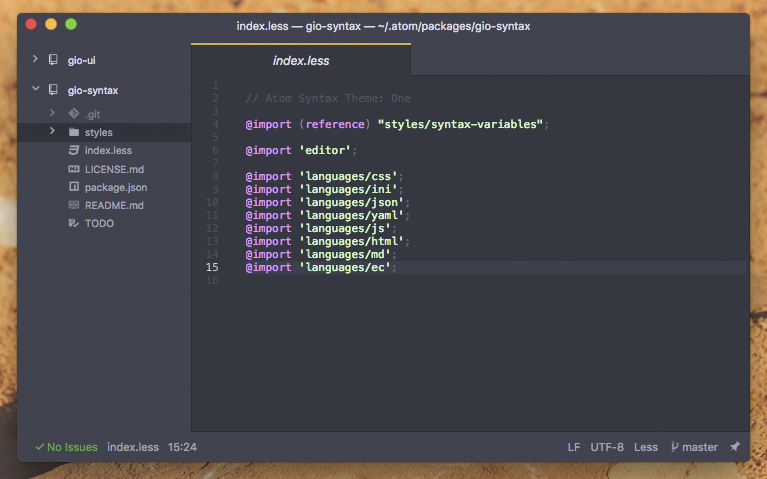 A syntax theme for Atom inspired by JetBrains’ Darcula theme for IntelliJ, RubyMine and their other IDEs. It features more vivid colors than the original Darcula, but tries to keep as close as possible. 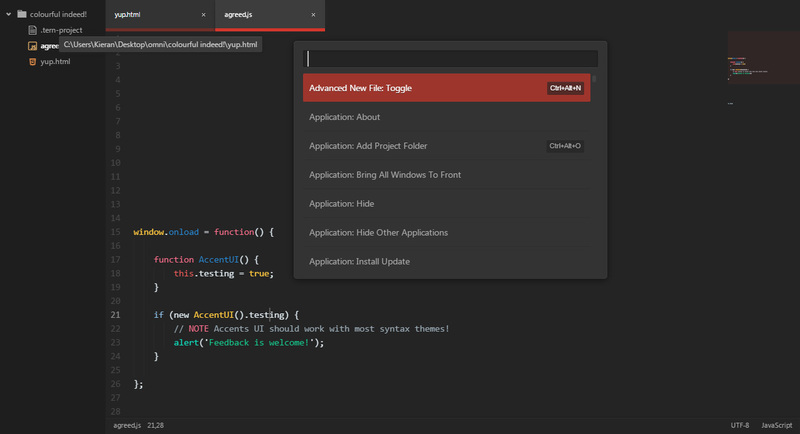 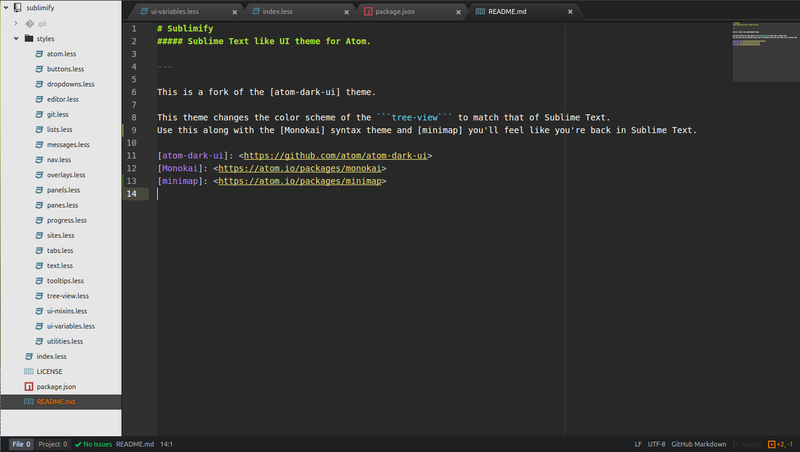 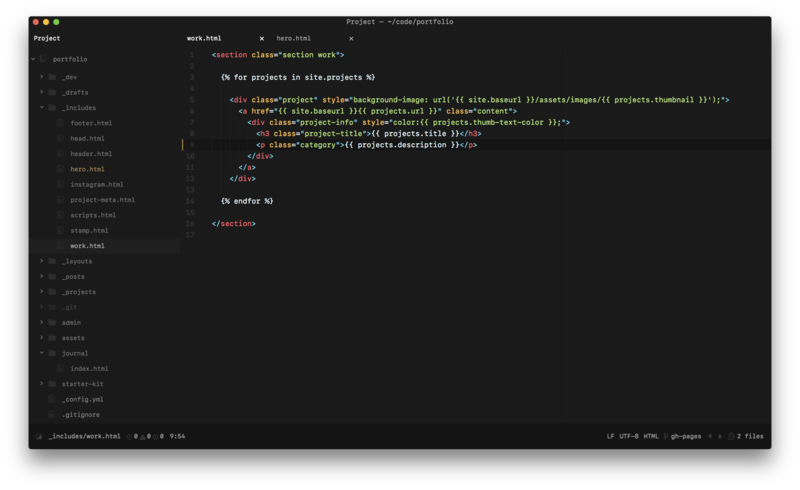 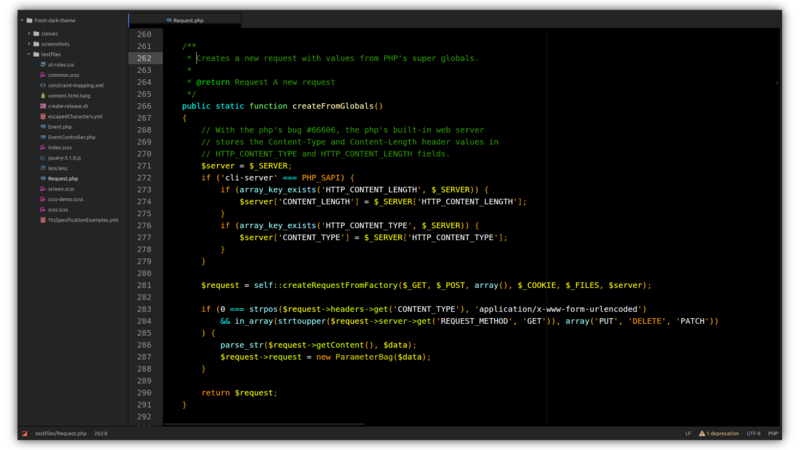 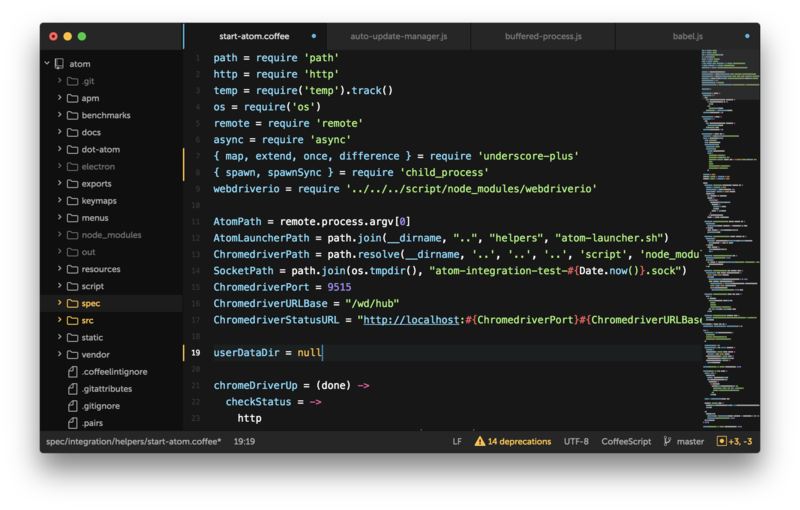 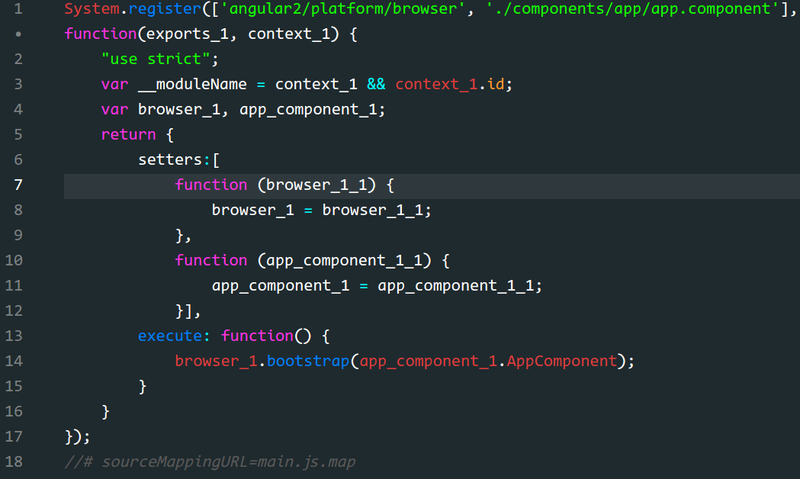 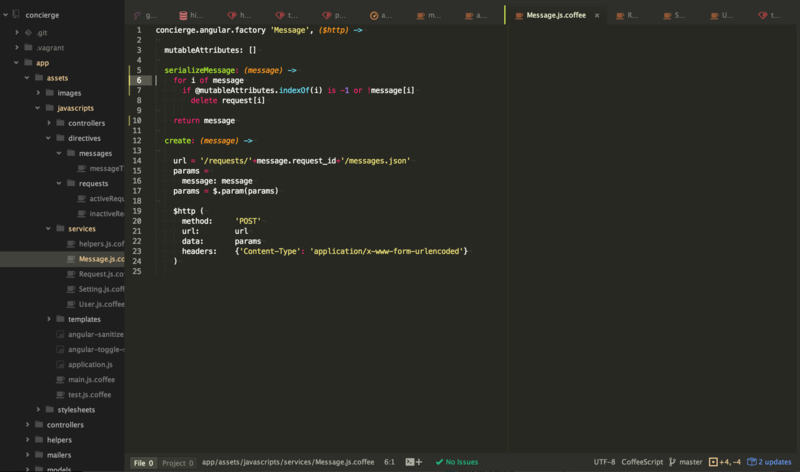 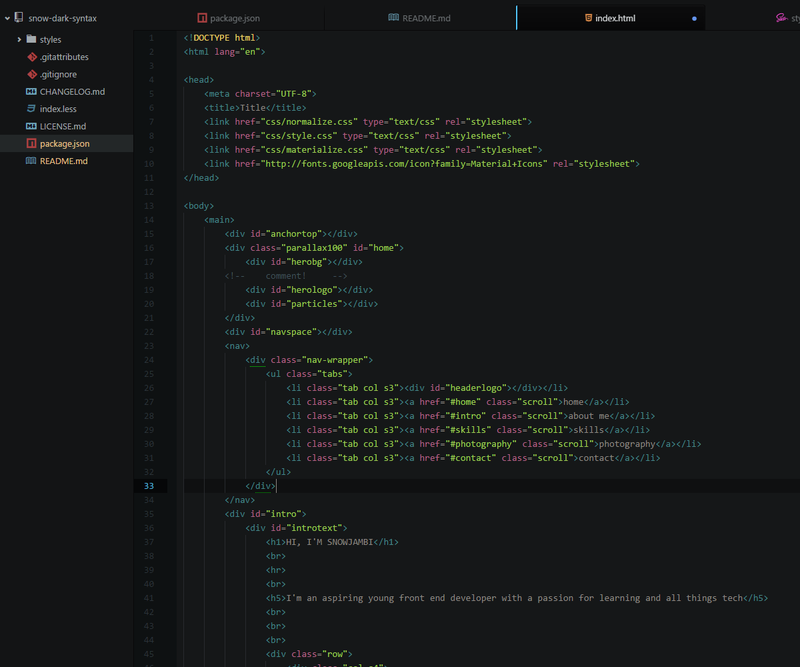 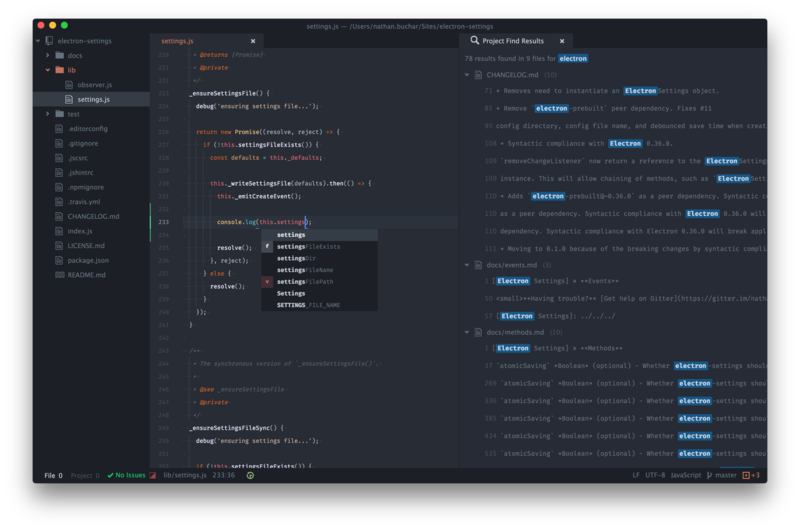 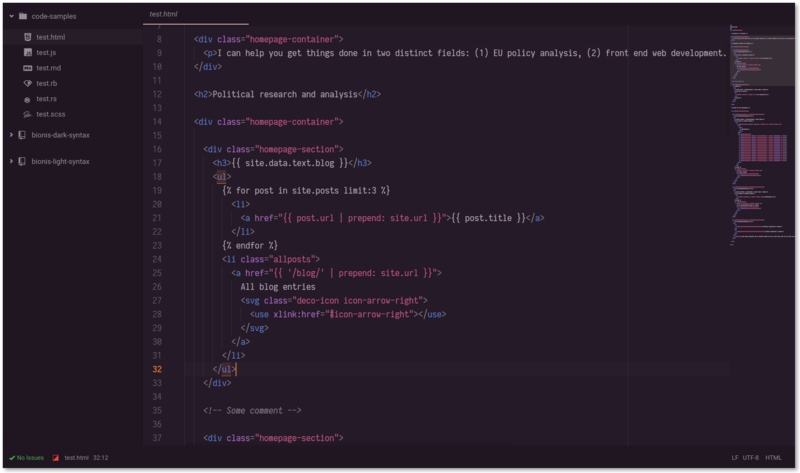 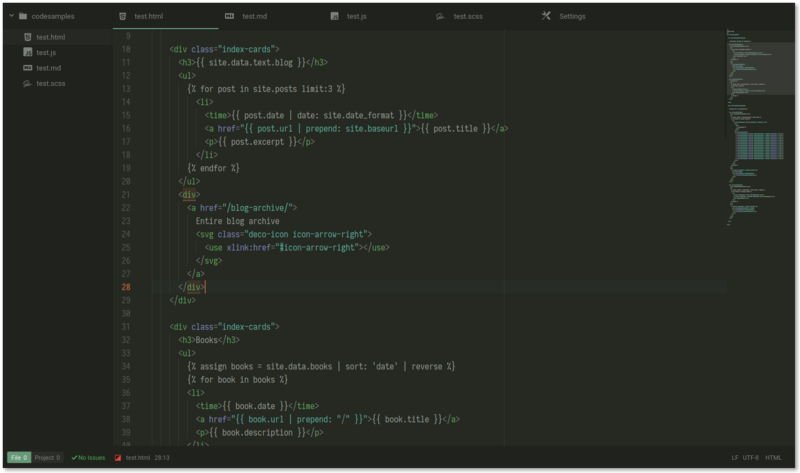 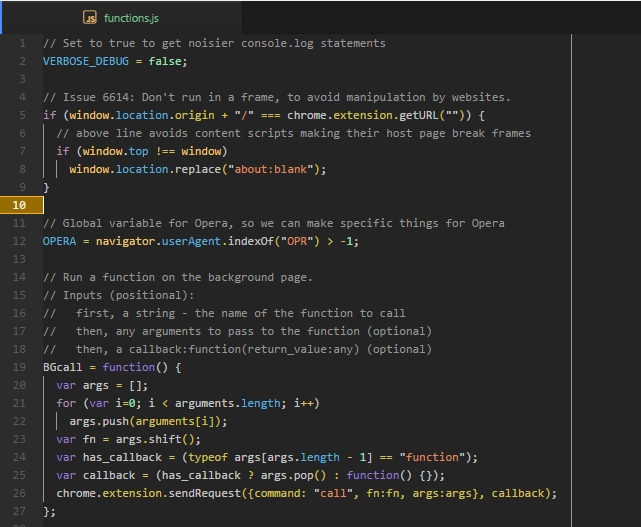 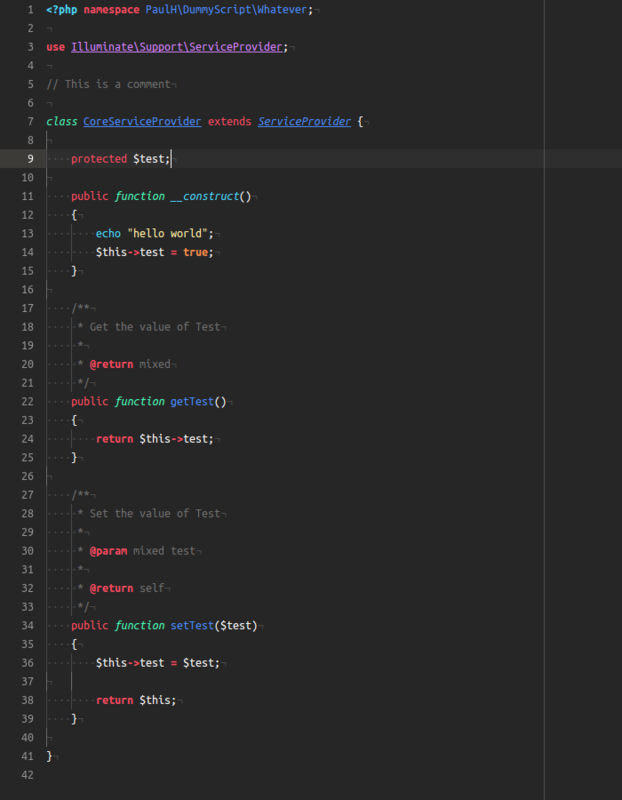 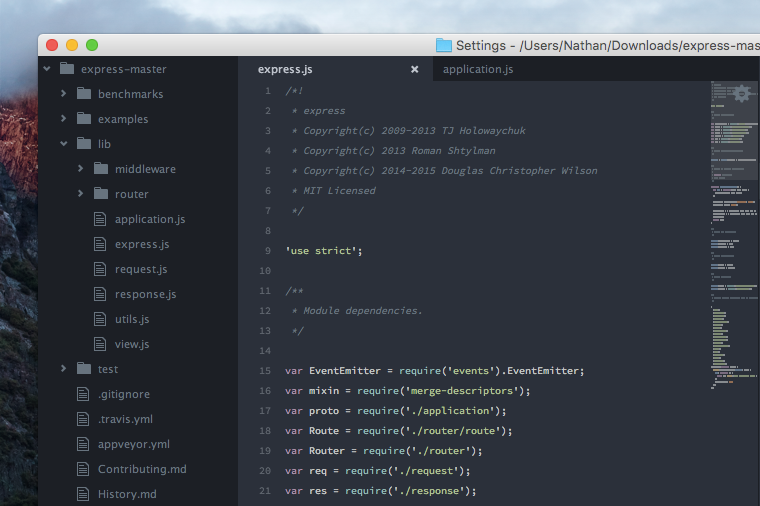 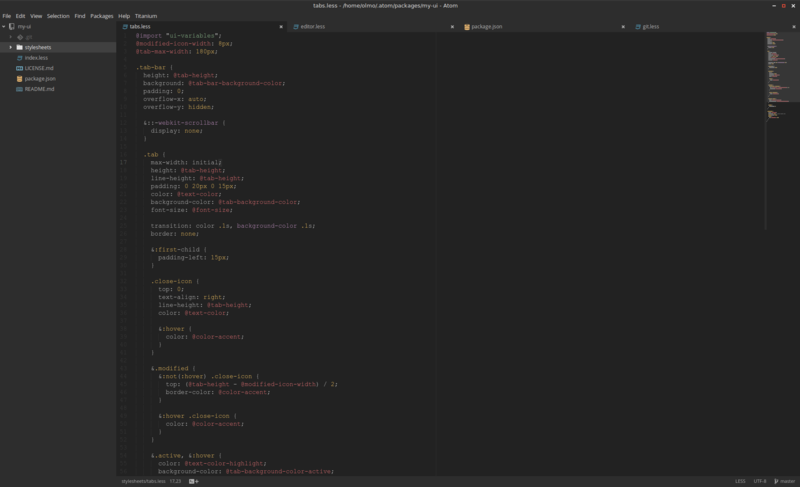 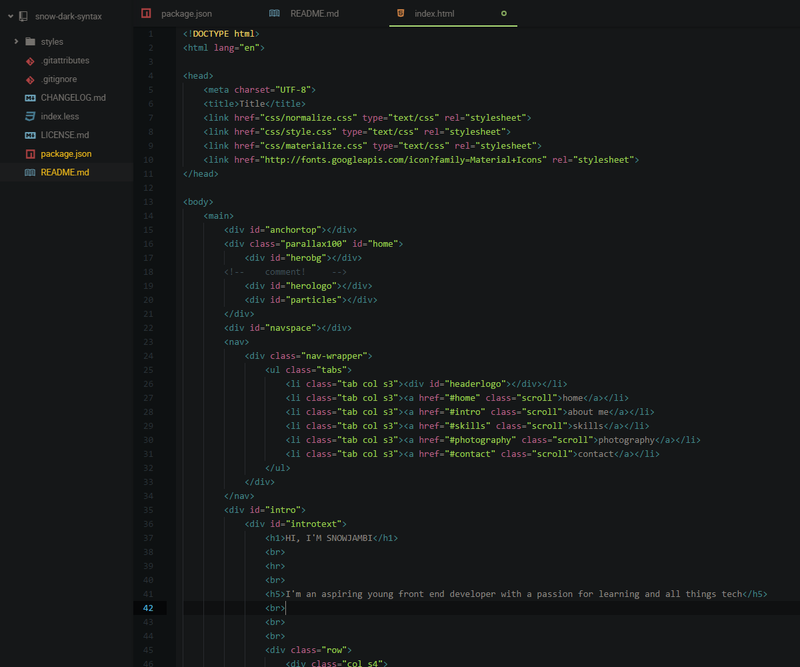 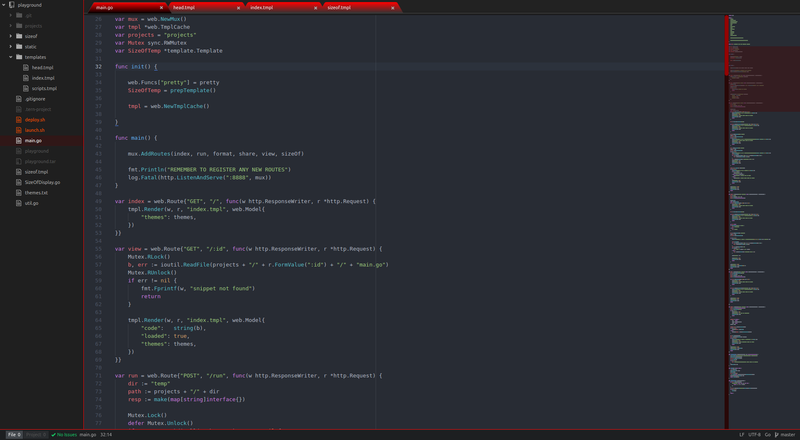 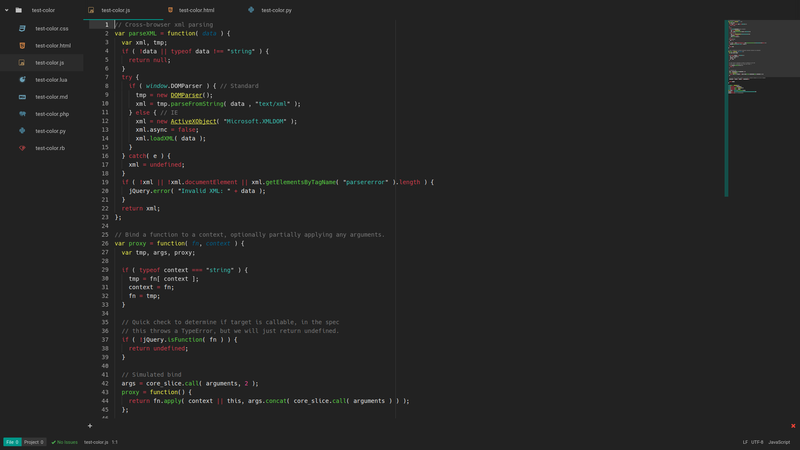 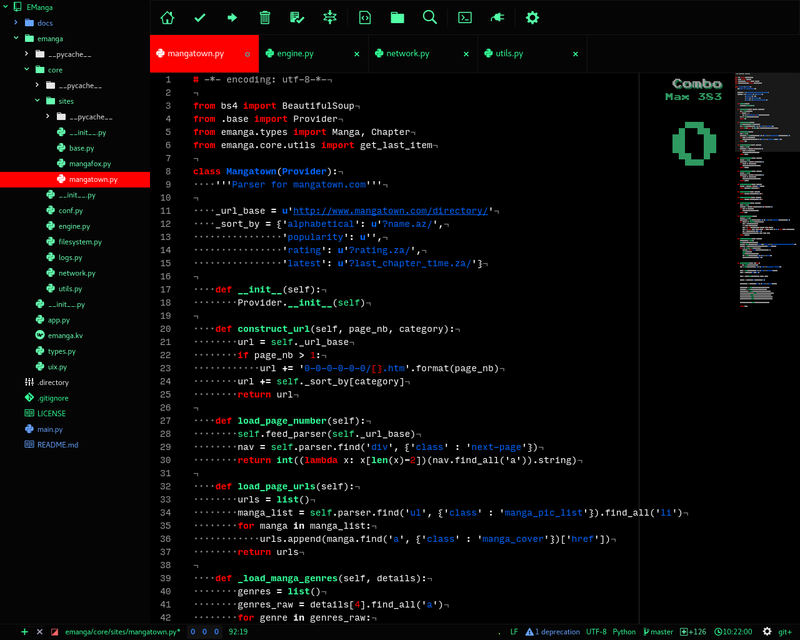 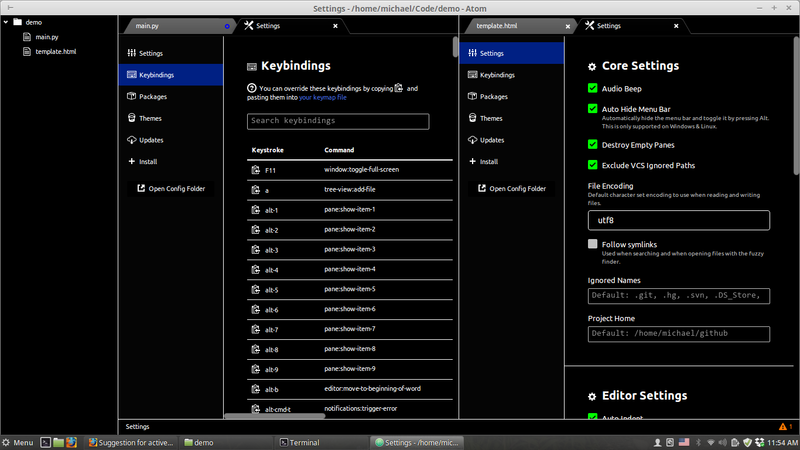 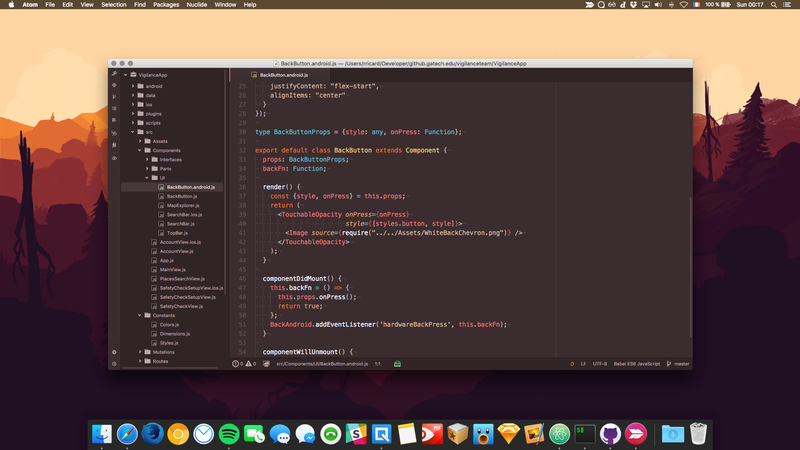 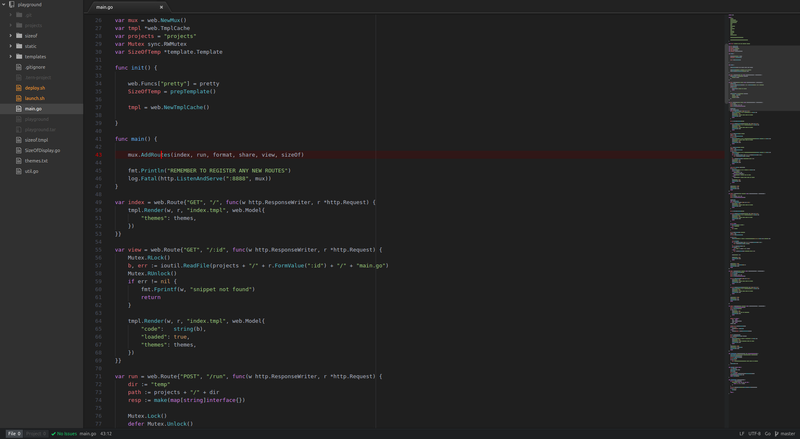 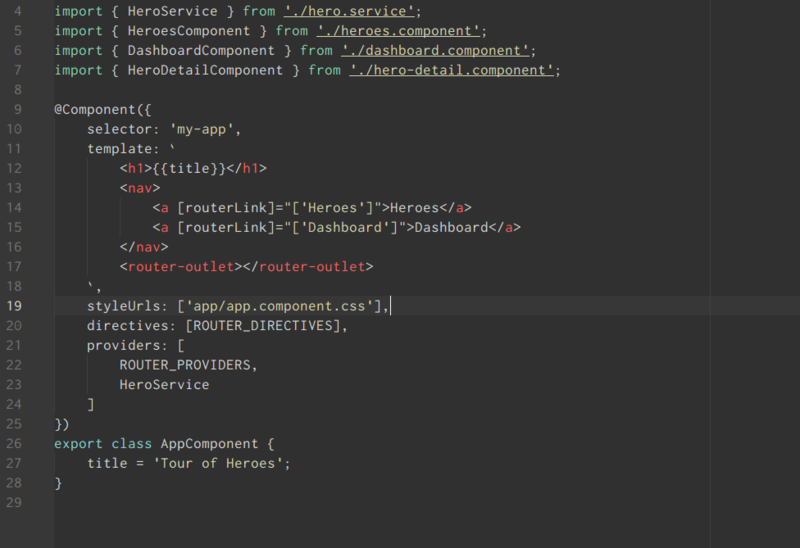 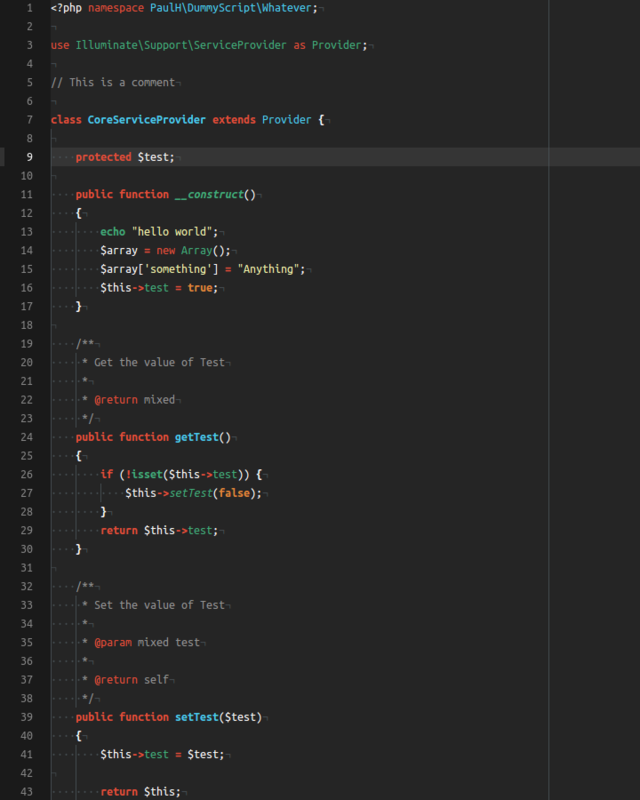 This syntax theme is based on Atom’s ‘One Dark’ theme and works best with the ‘One Dark’ UI theme. 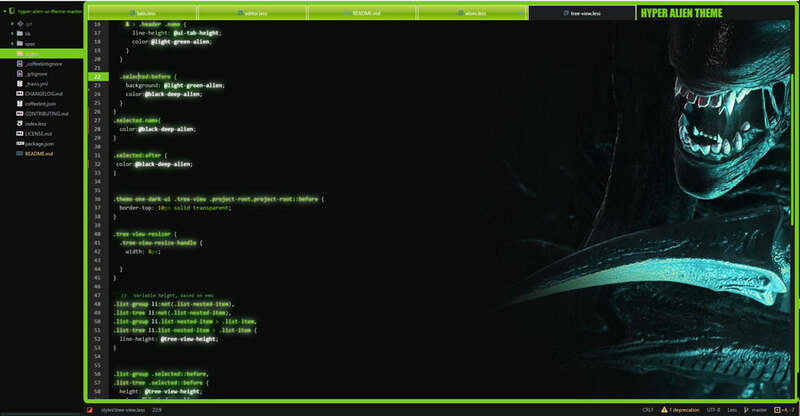 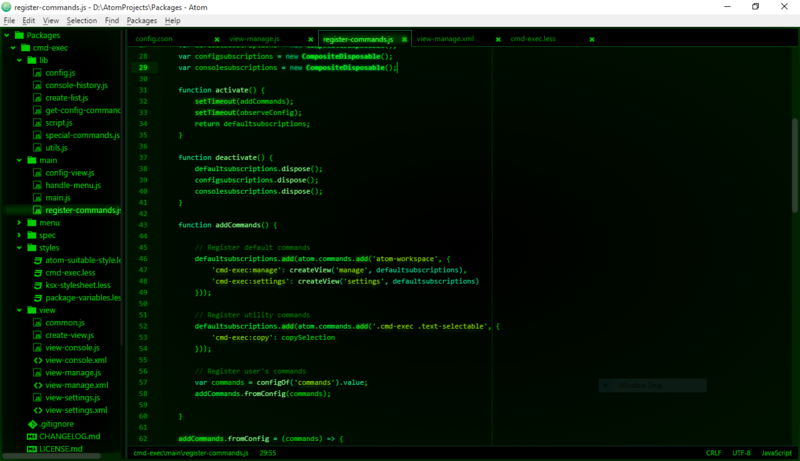 A ‘Zero Dark Matrix’ theme for Atom used in Google Chrome’s developer tools. 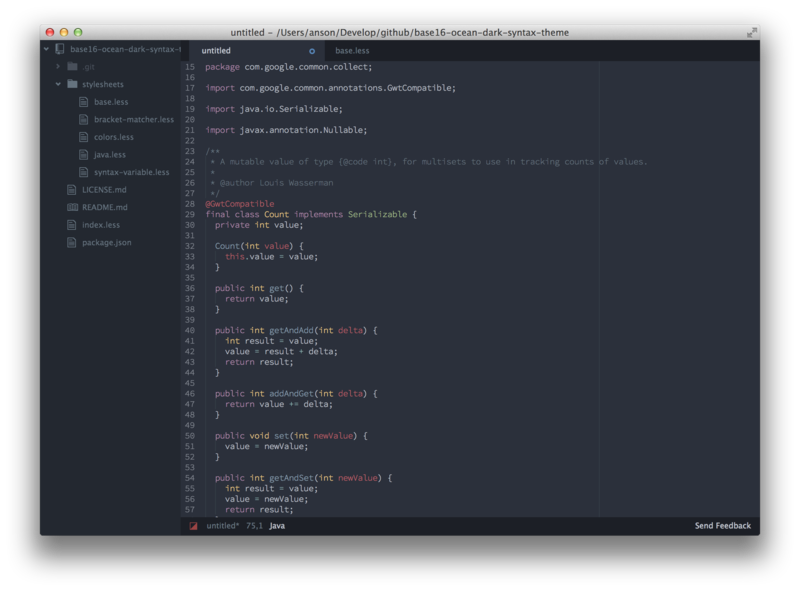 Closest thing to a 1:1 port of Xcode’s Dusk theme. 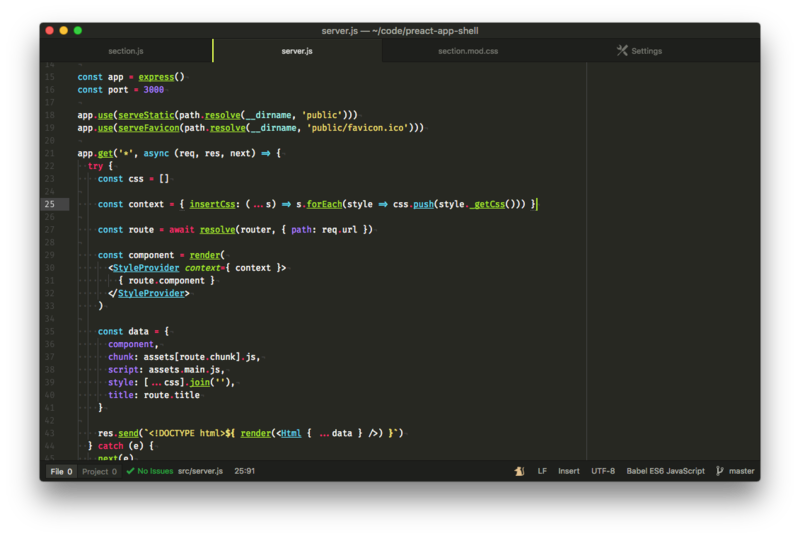 Rubiks-Syntax is a theme based on the colours of a Rubik’s Cube. 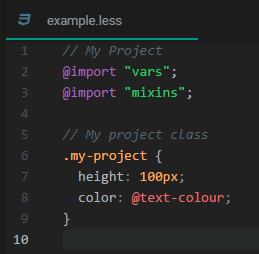 The goal is to bring bright and contrasting colours that enhance readability together. 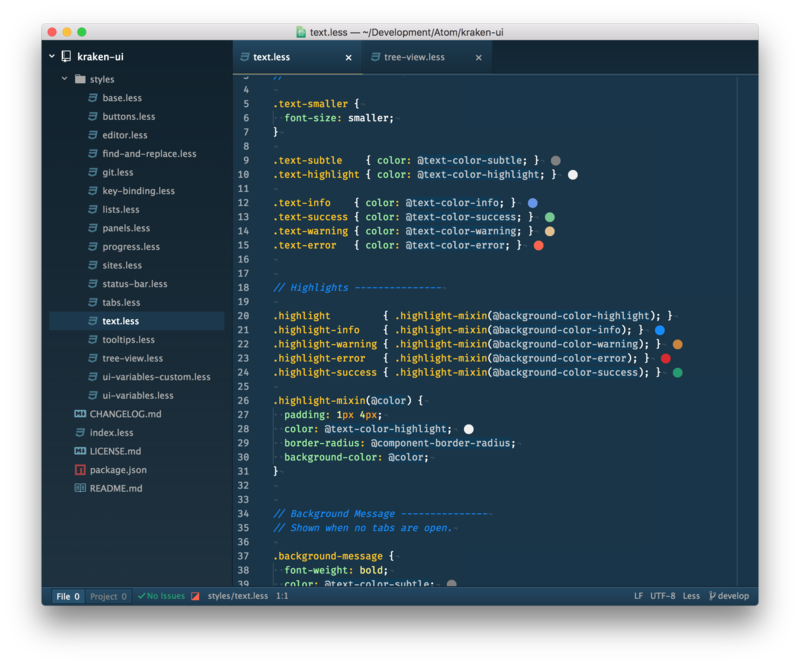 Dark blueish UI theme with soft colors for atom that’s keen on the eye but stull colorful. 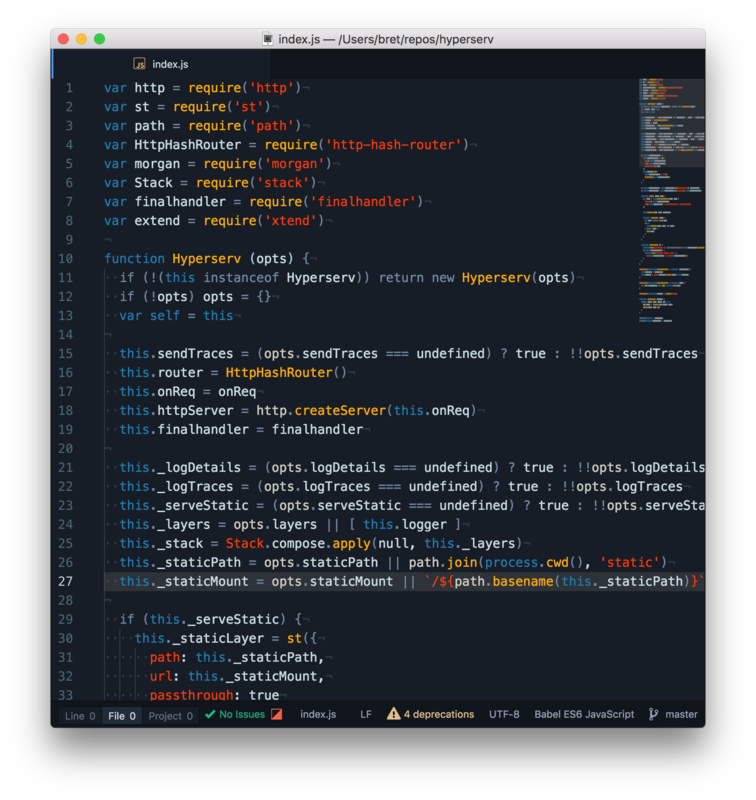 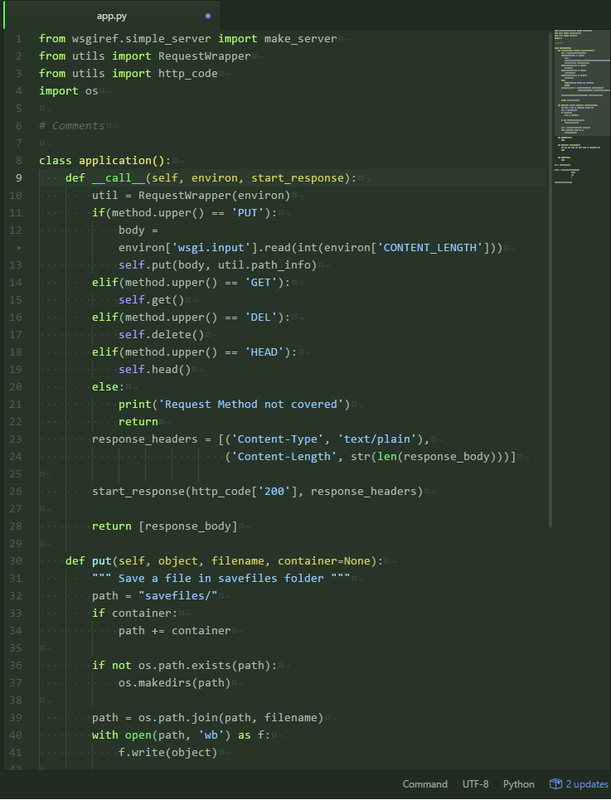 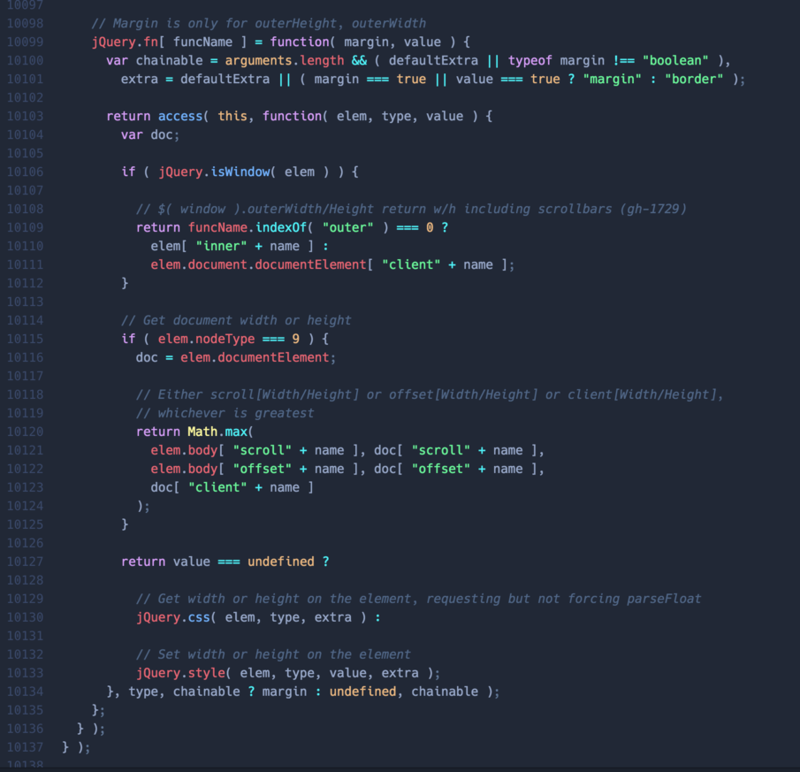 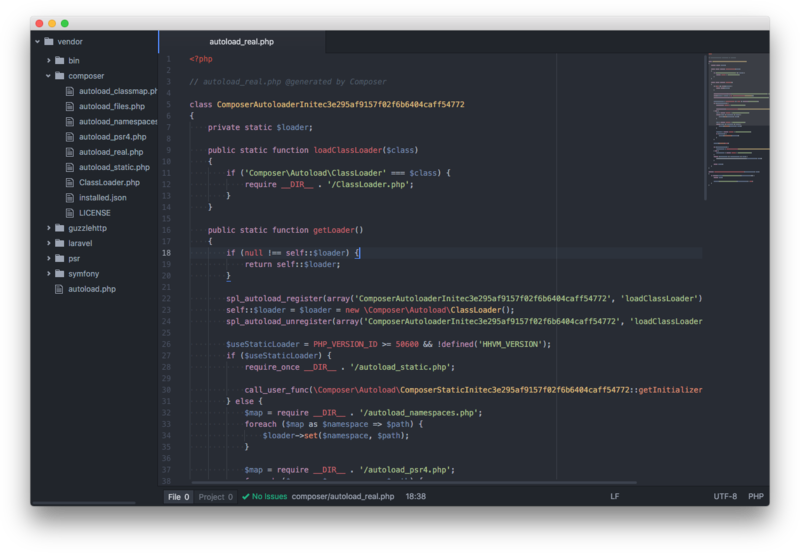 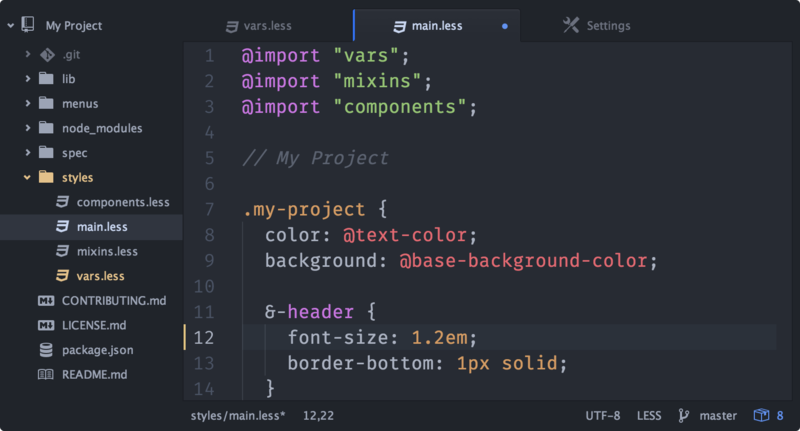 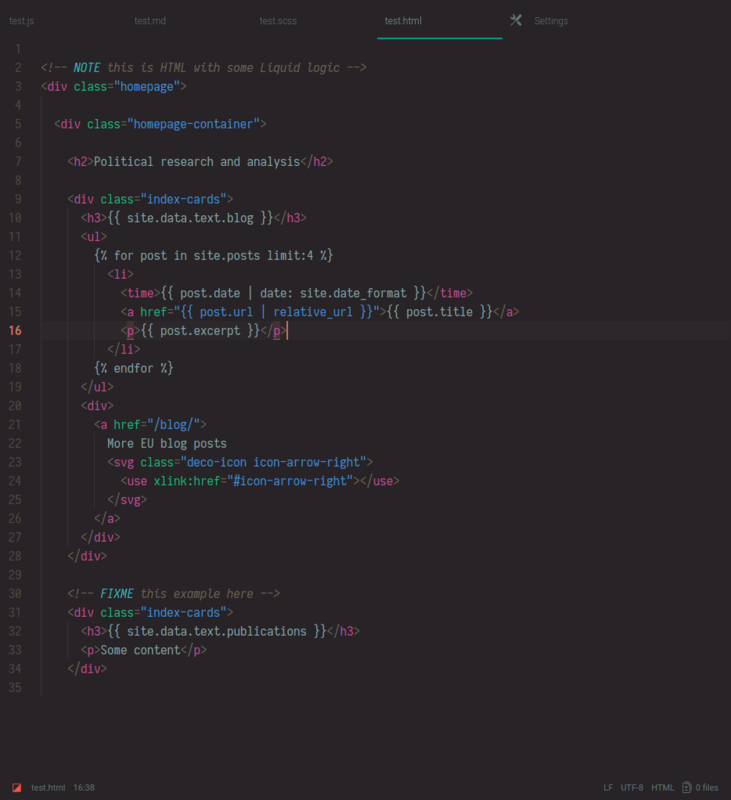 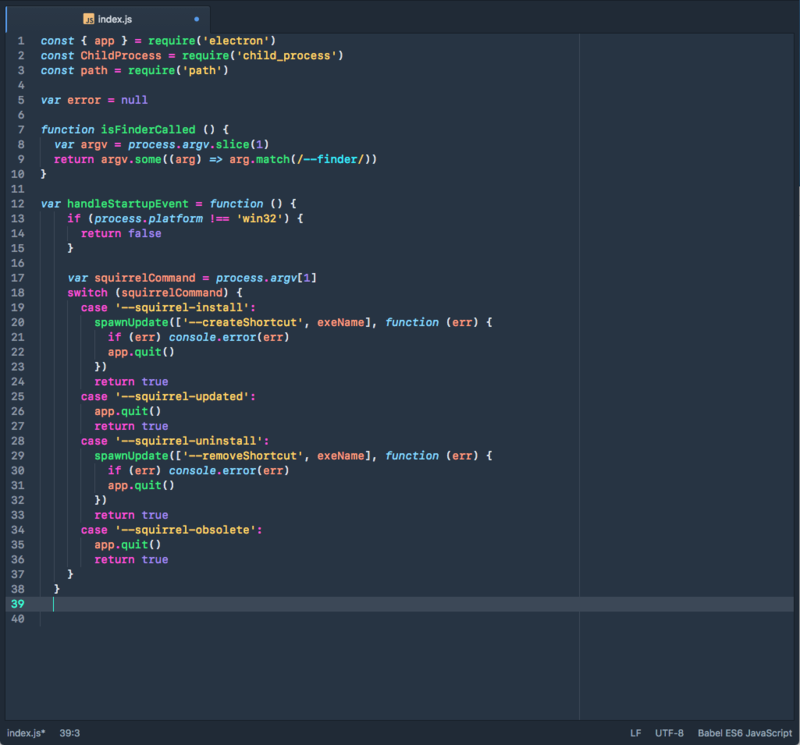 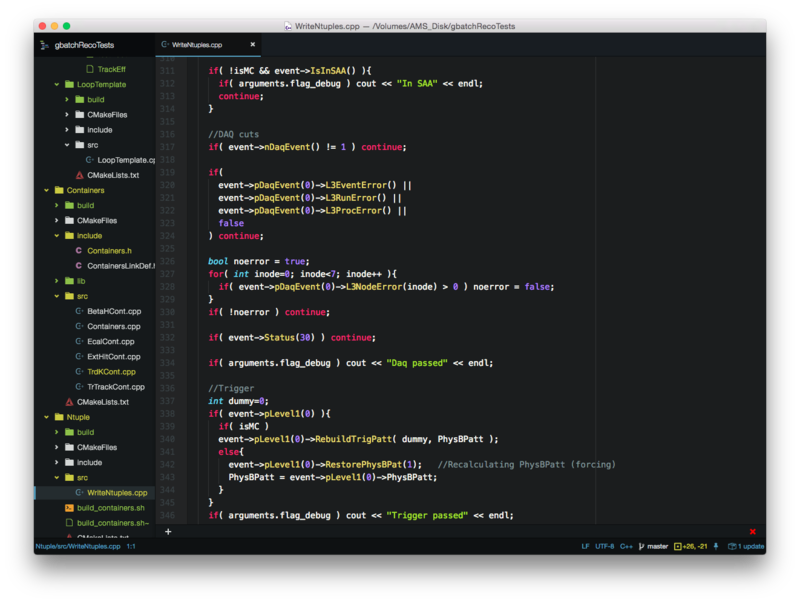 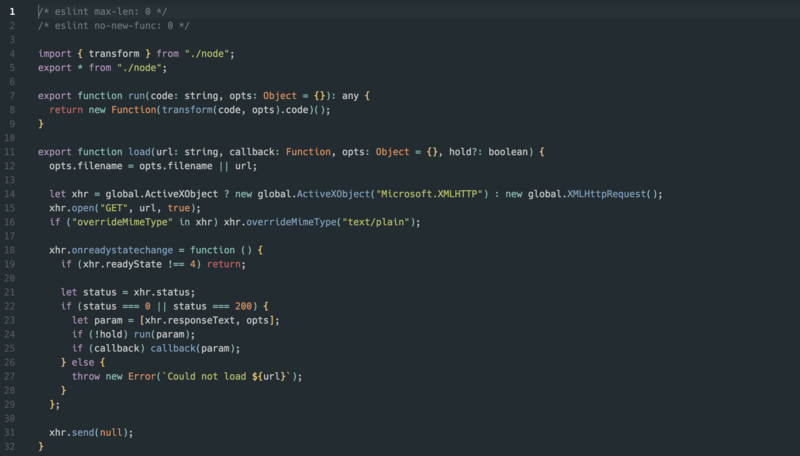 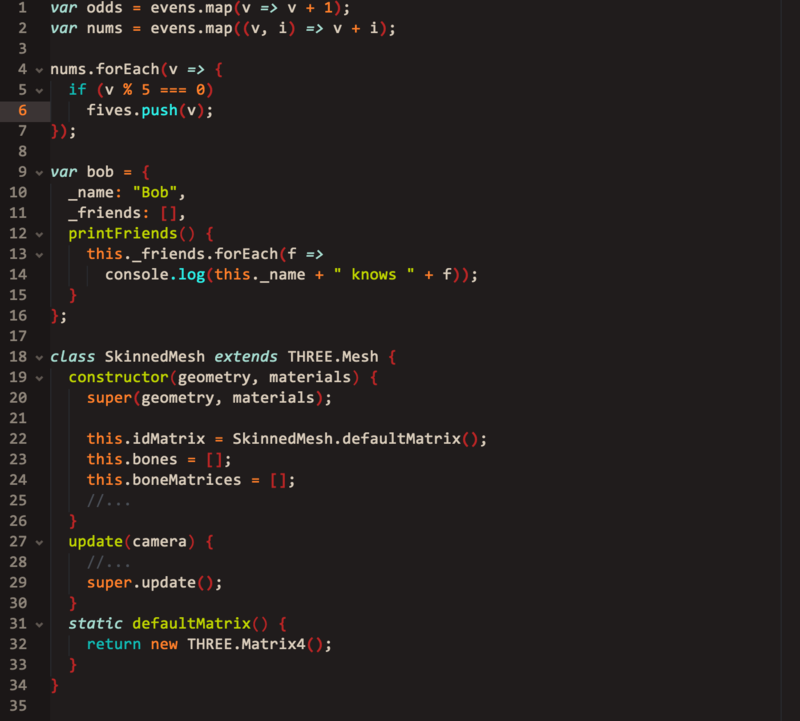 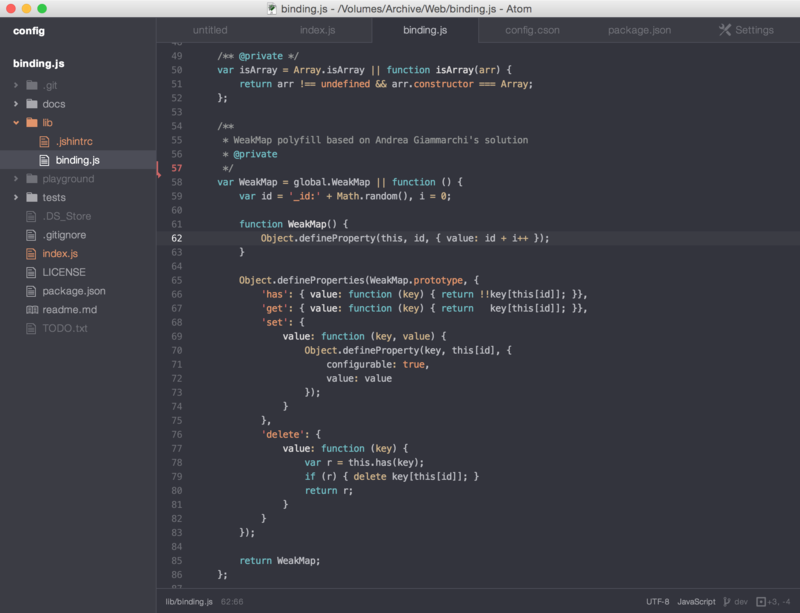 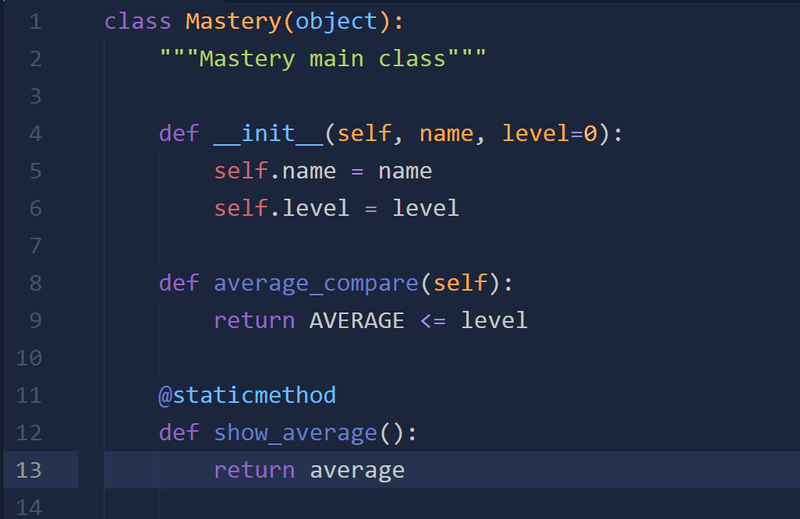 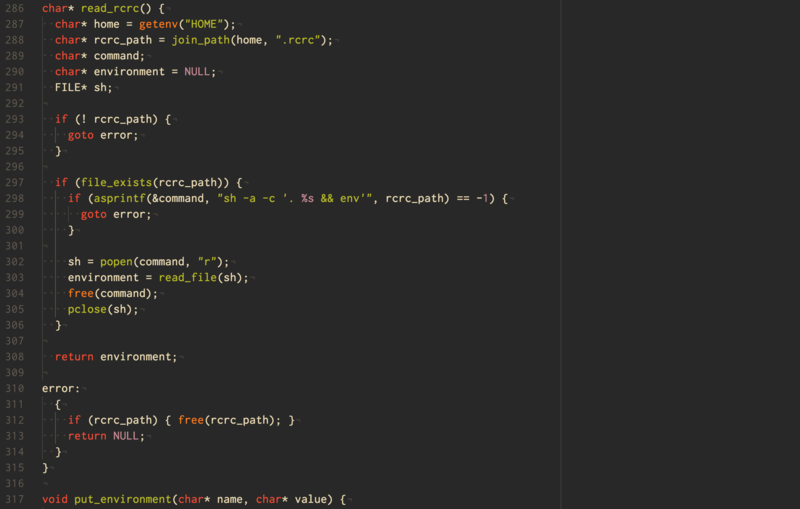 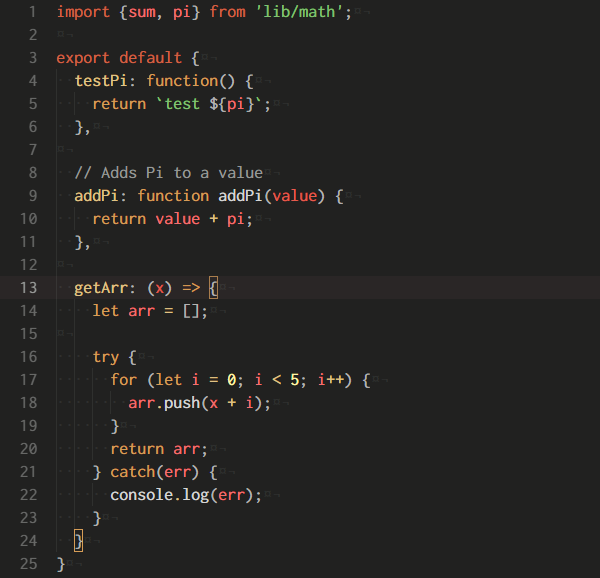 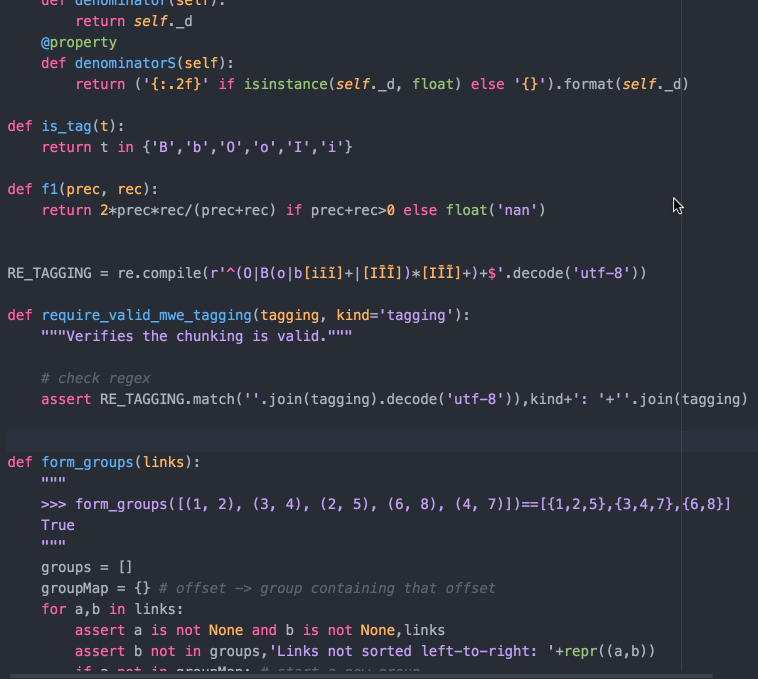 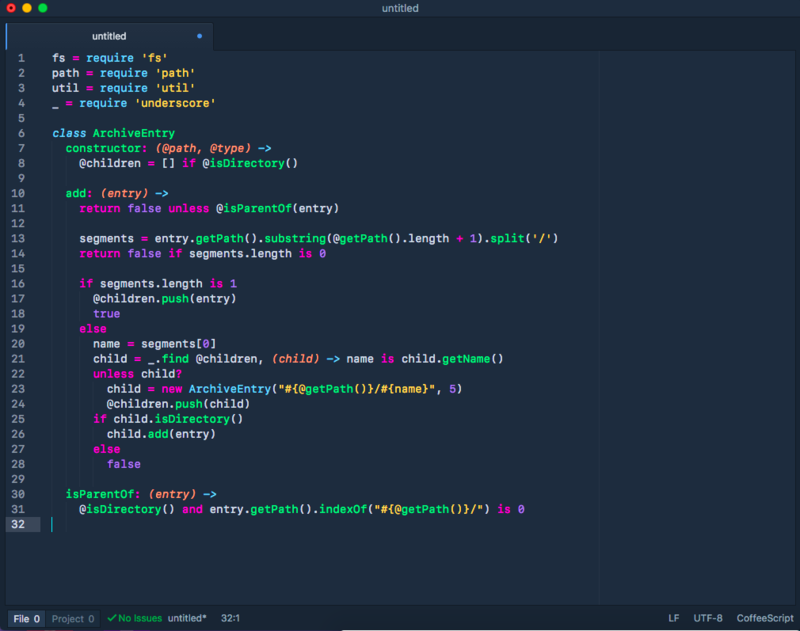 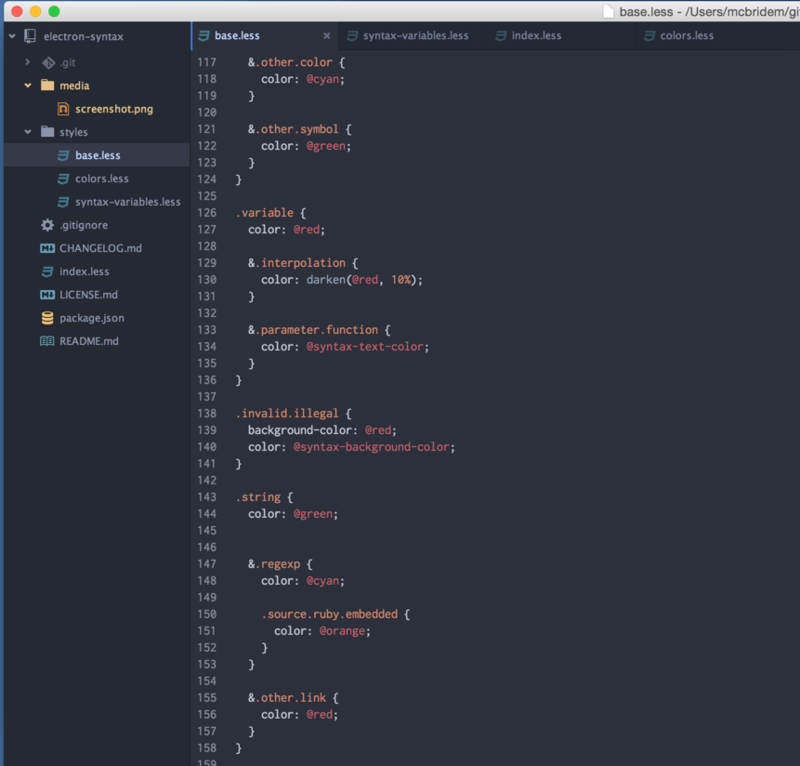 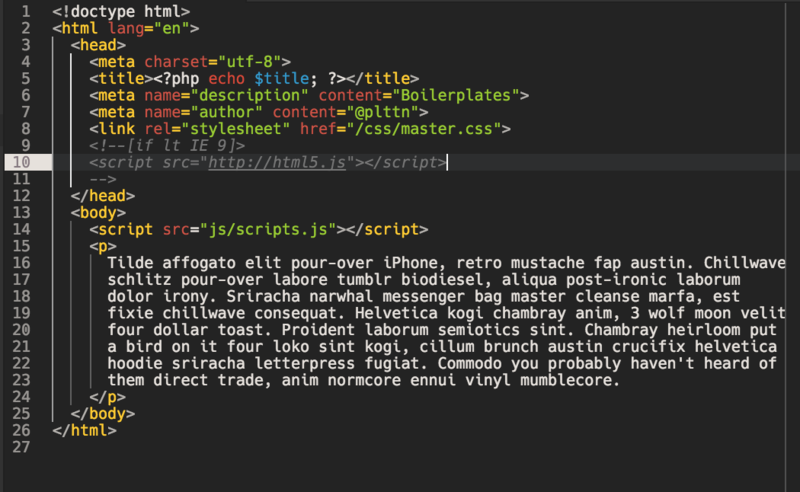 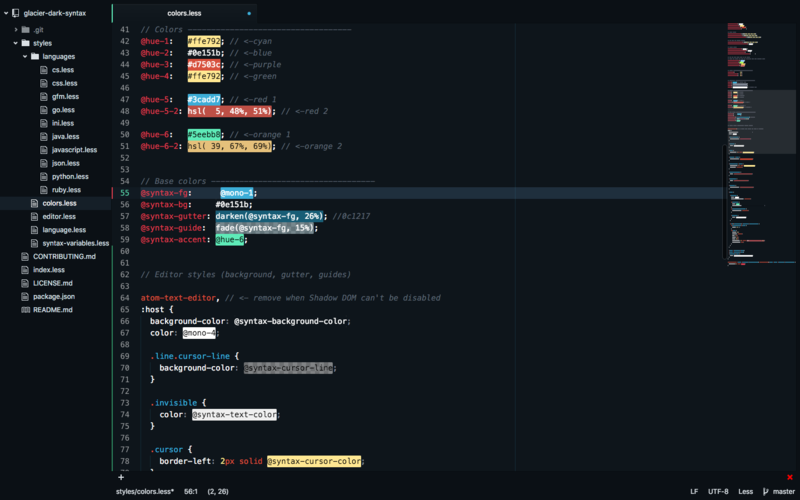 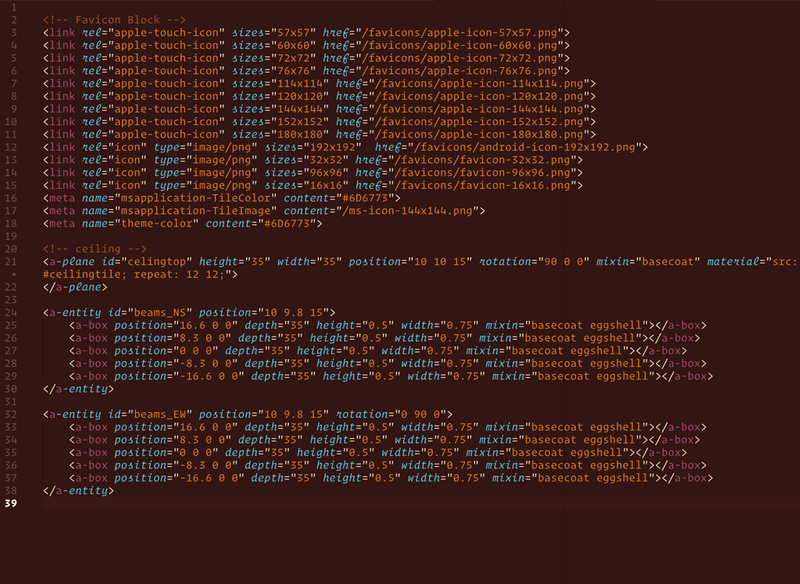 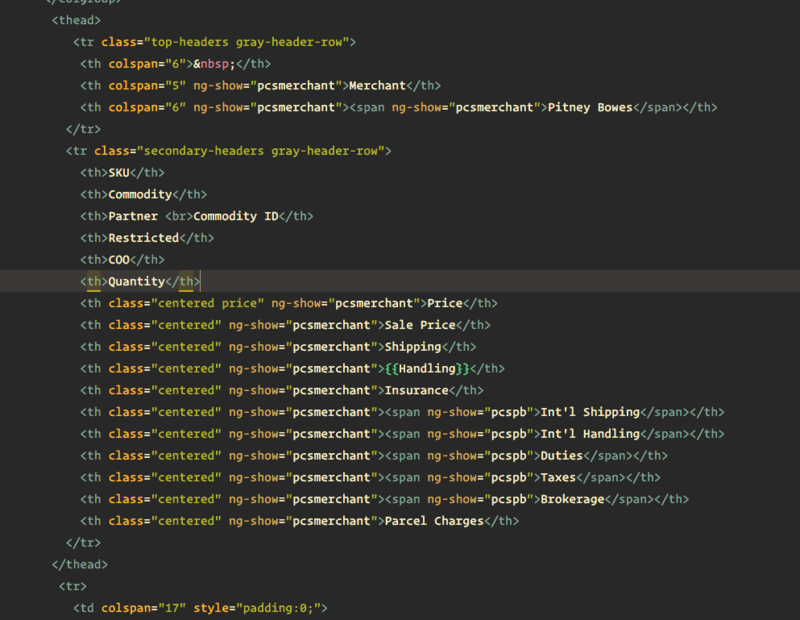 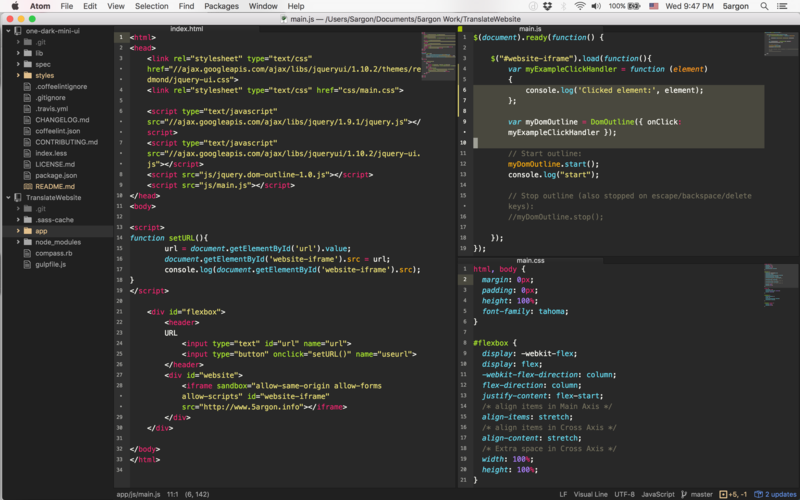 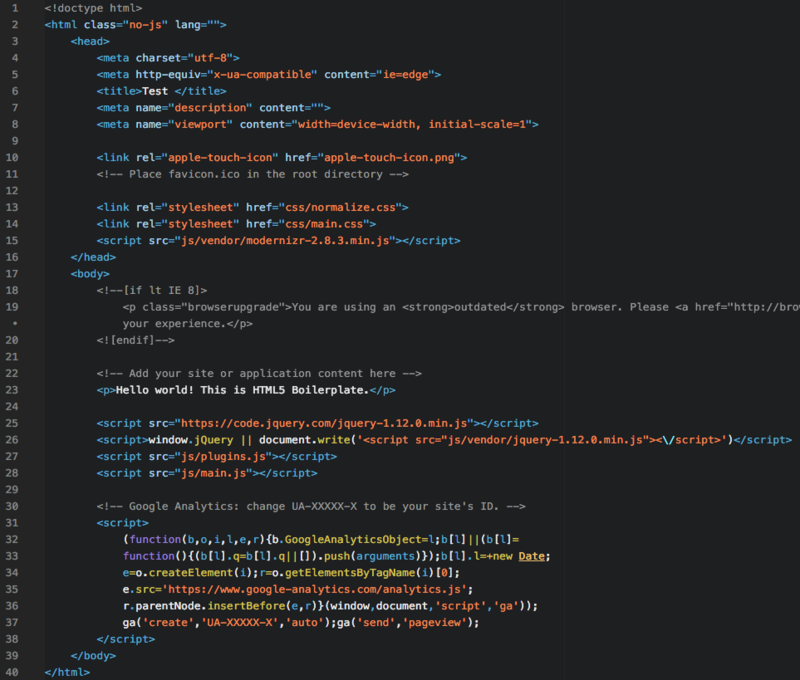 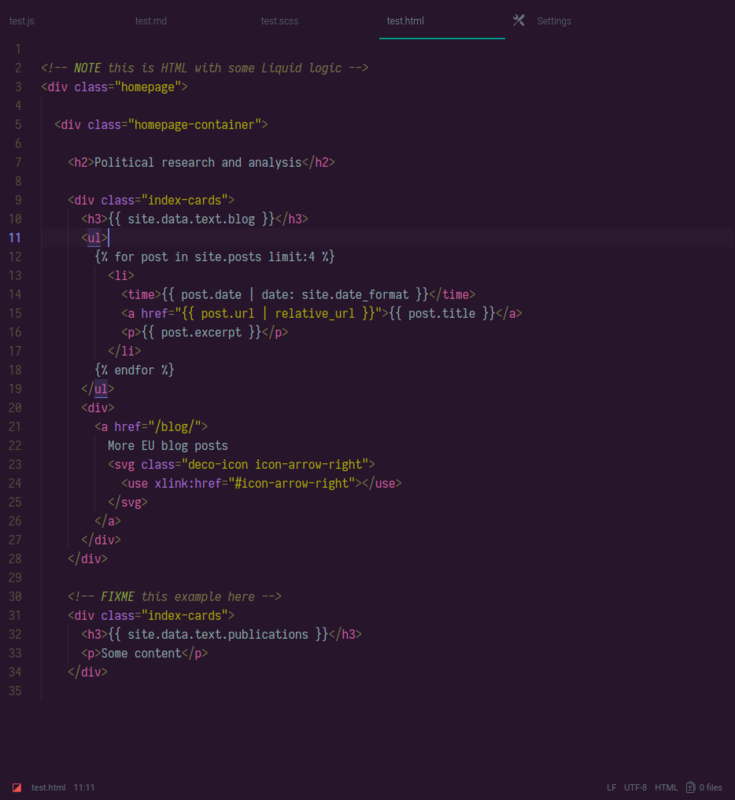 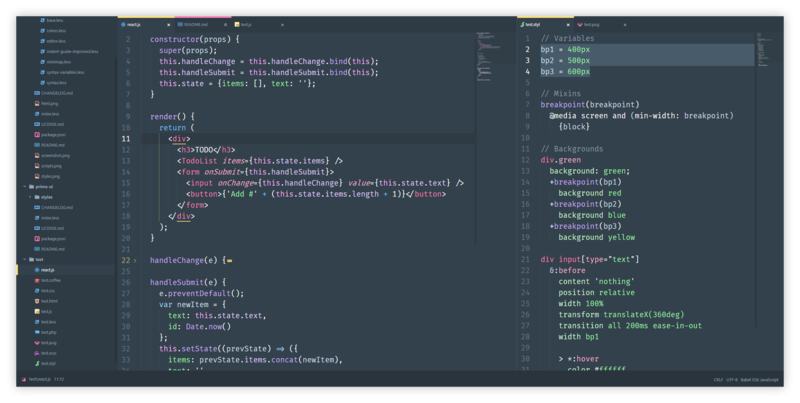 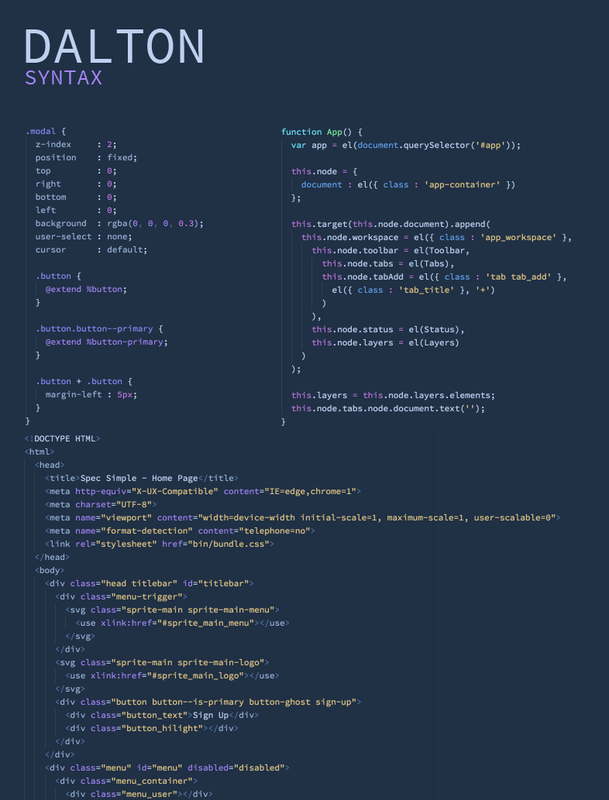 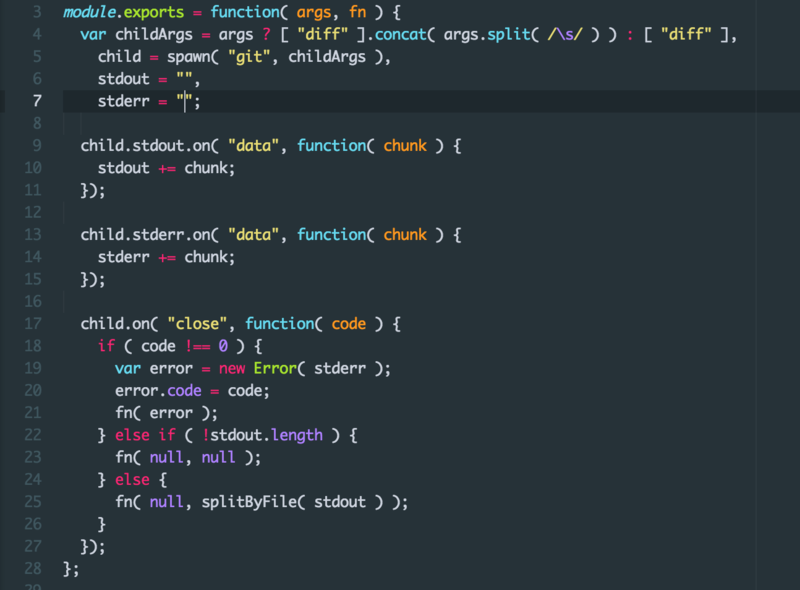 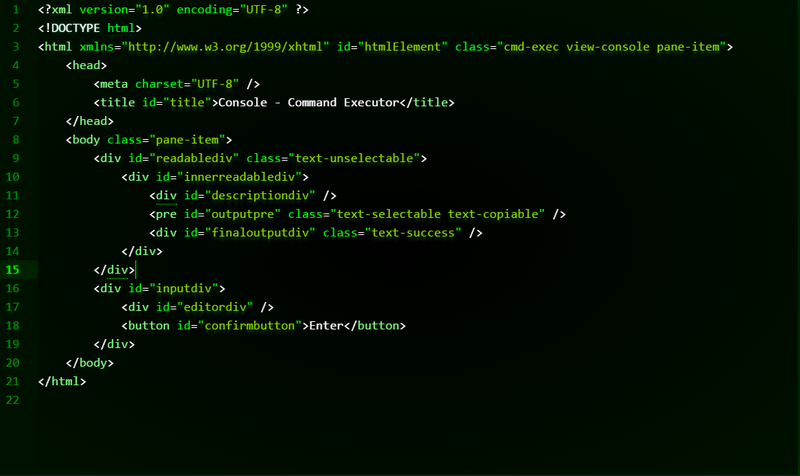 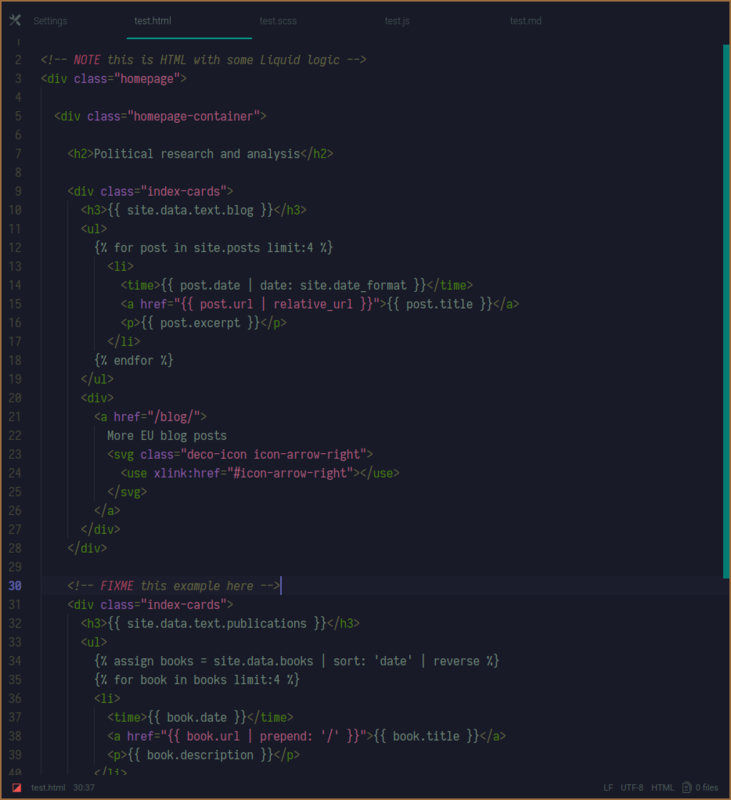 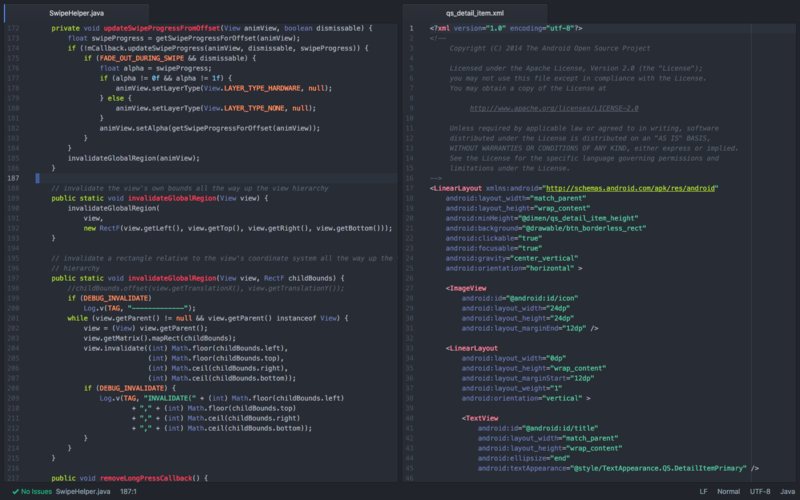 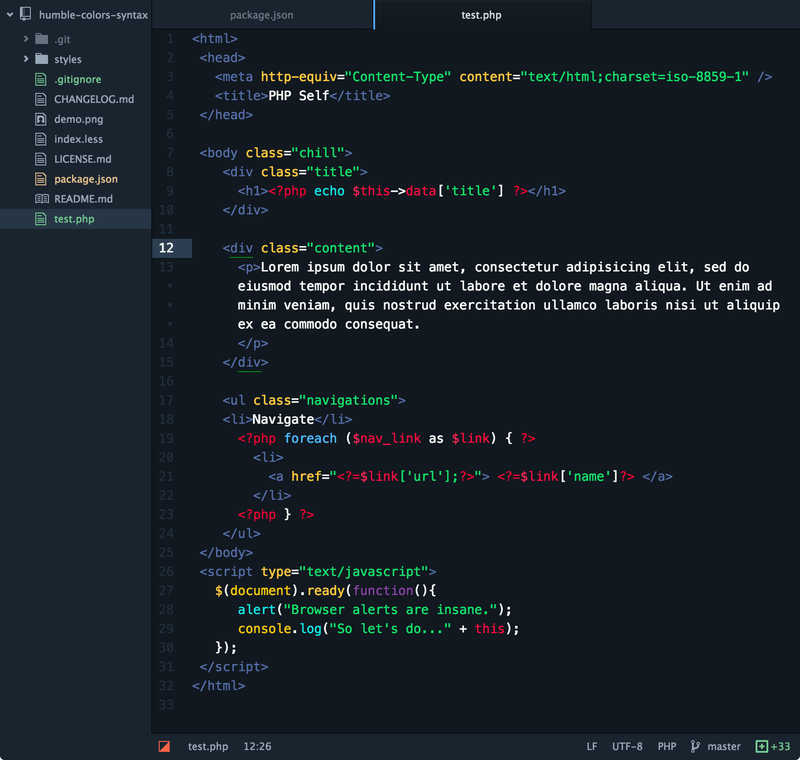 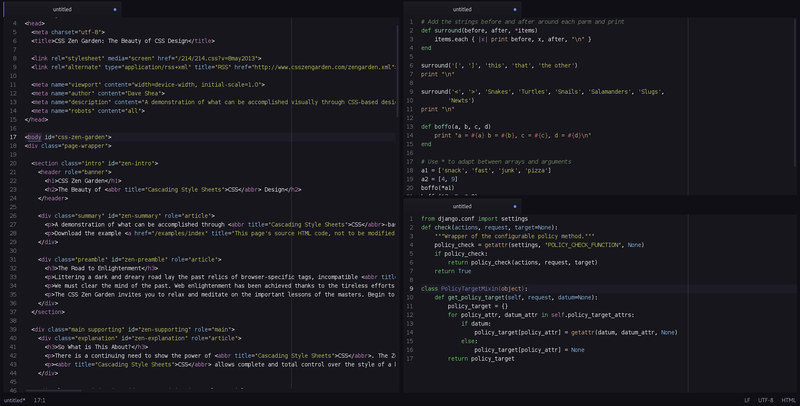 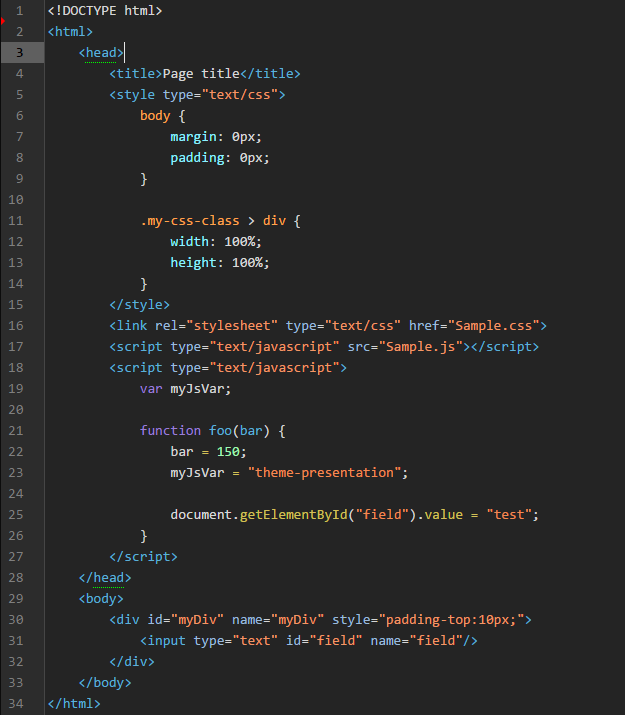 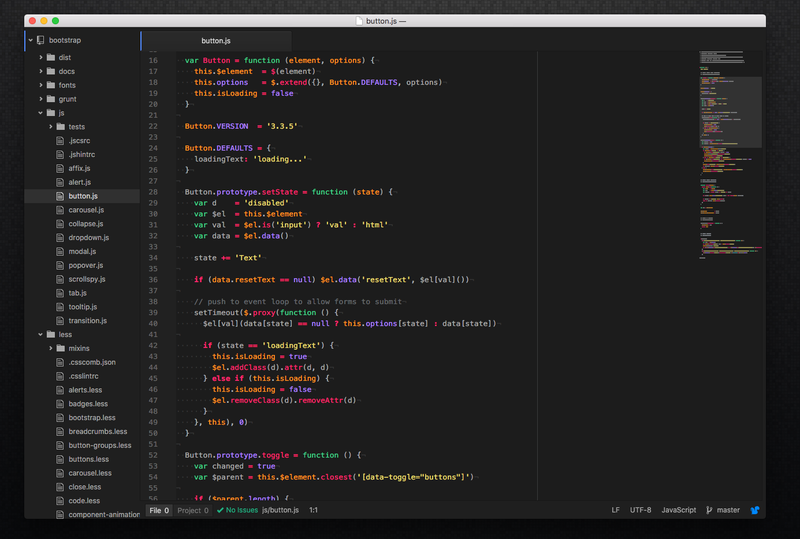 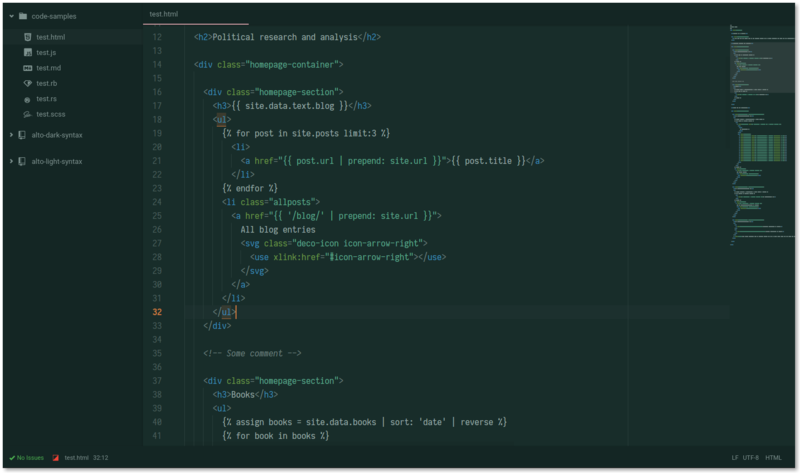 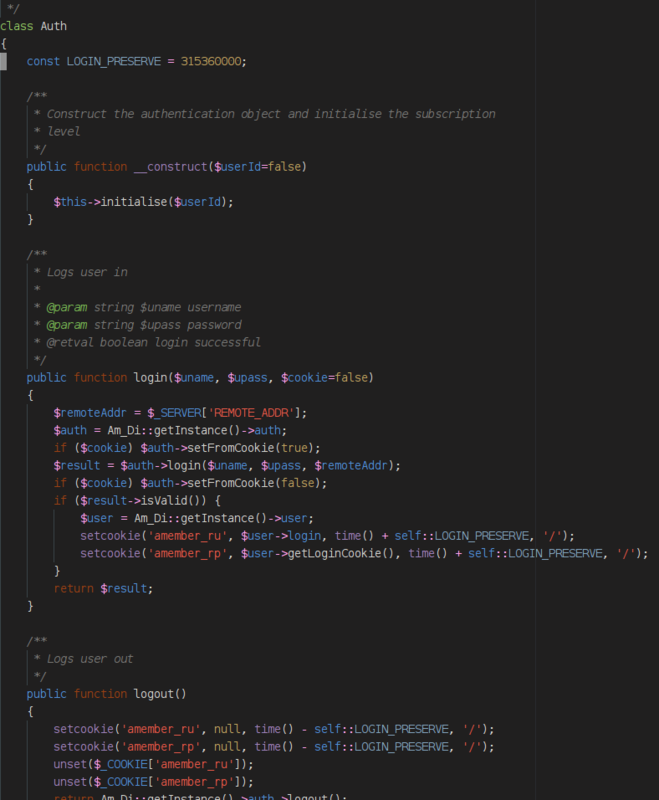 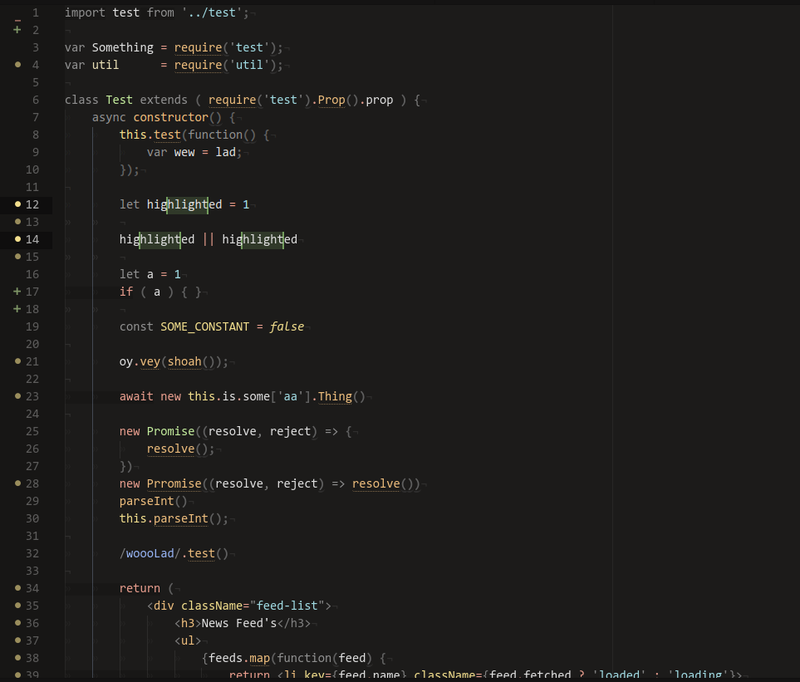 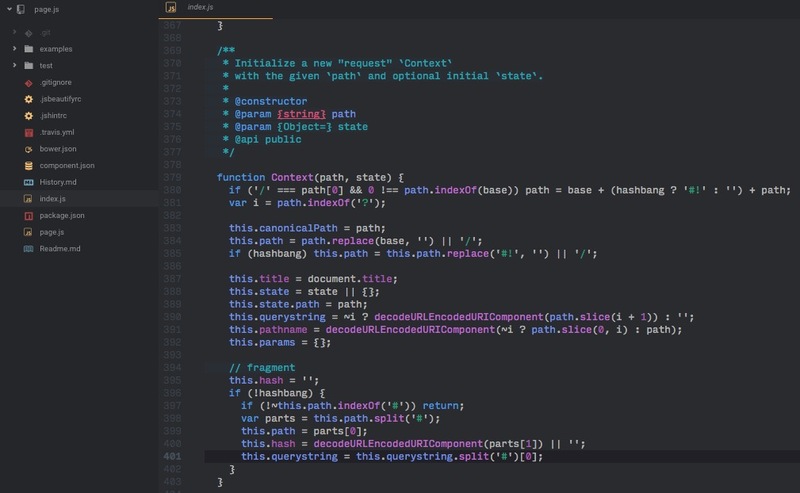 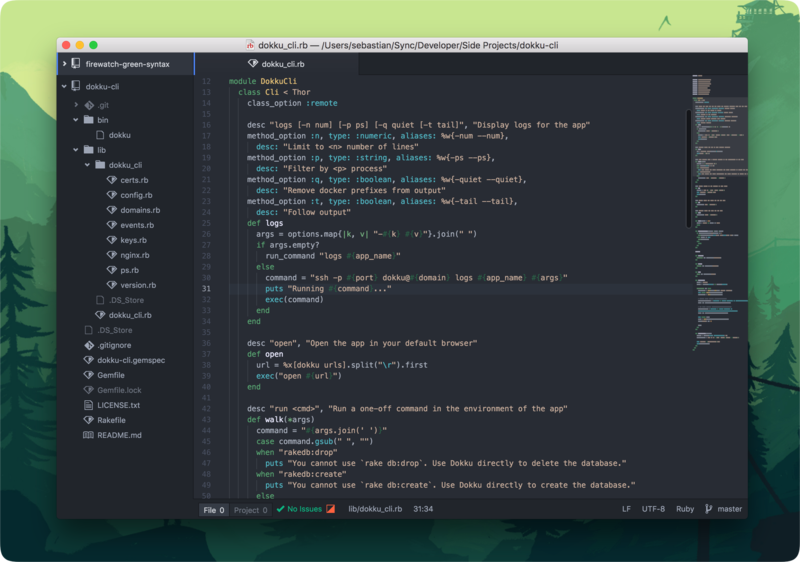 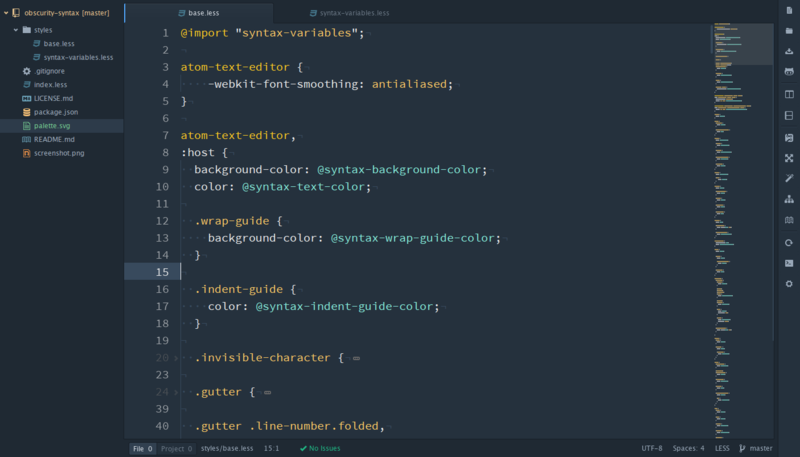 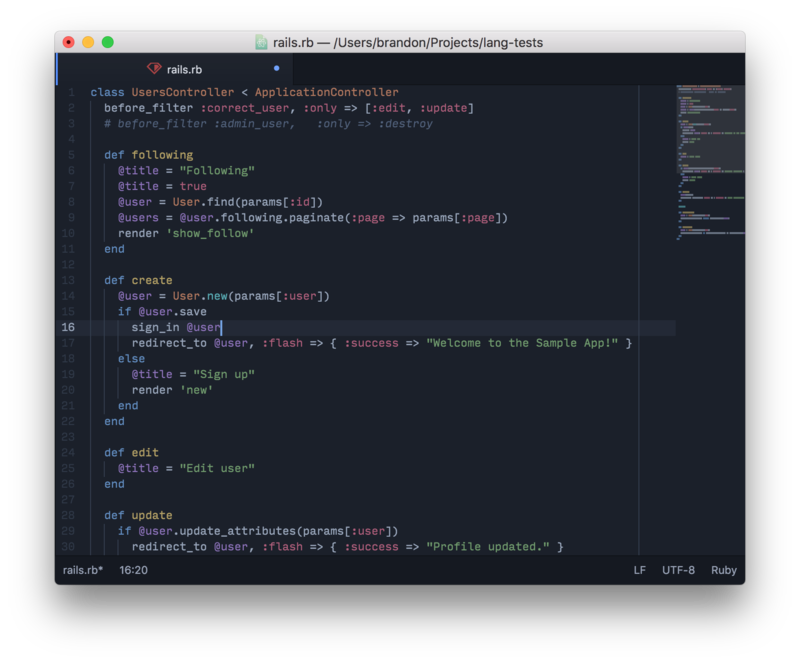 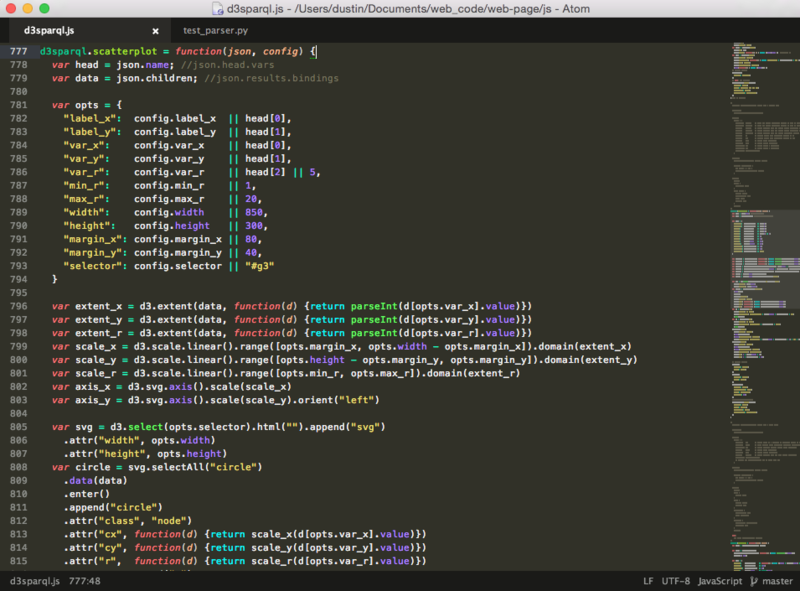 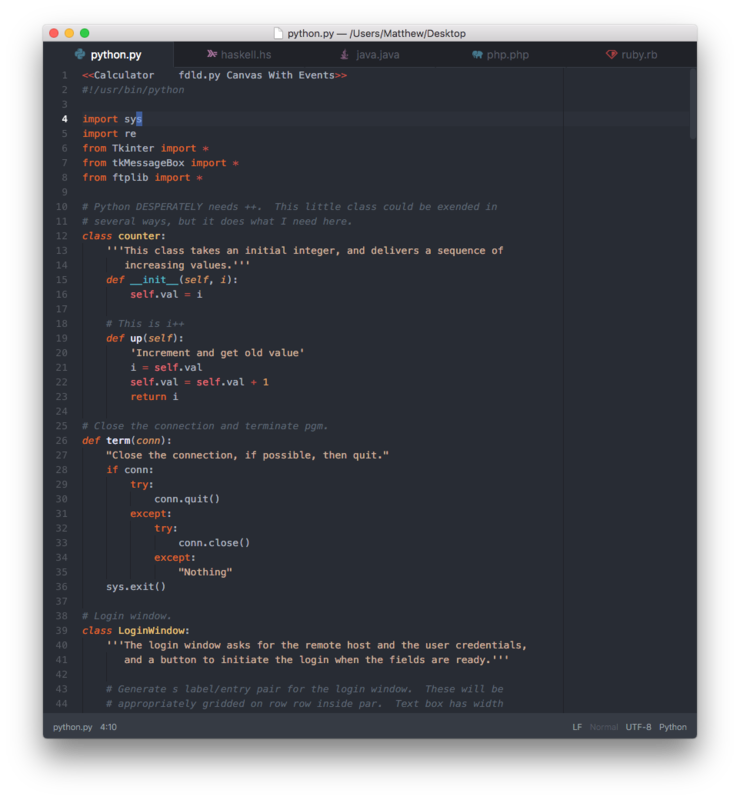 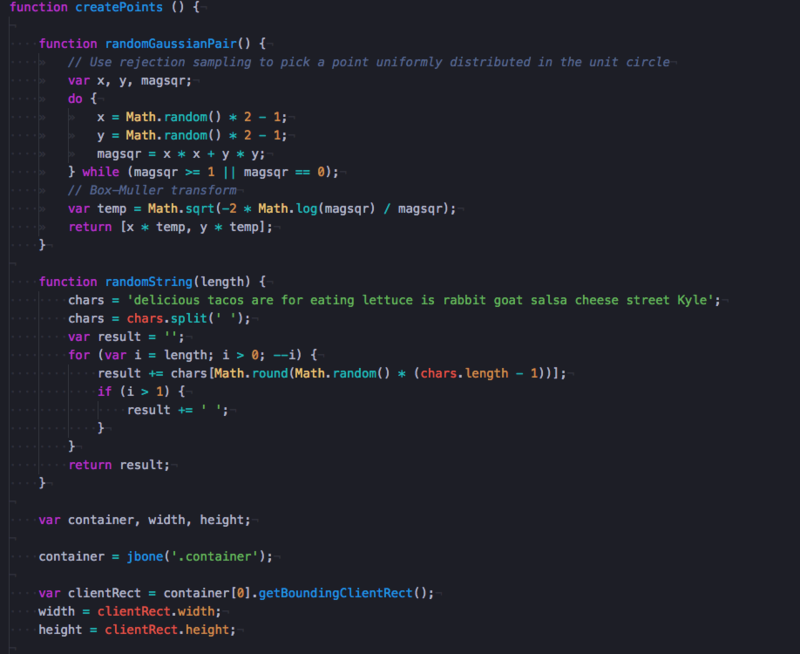 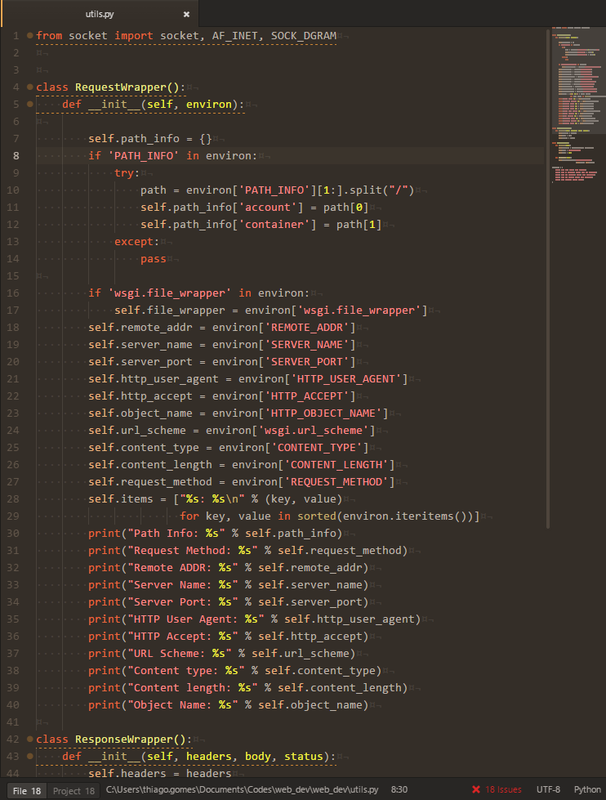 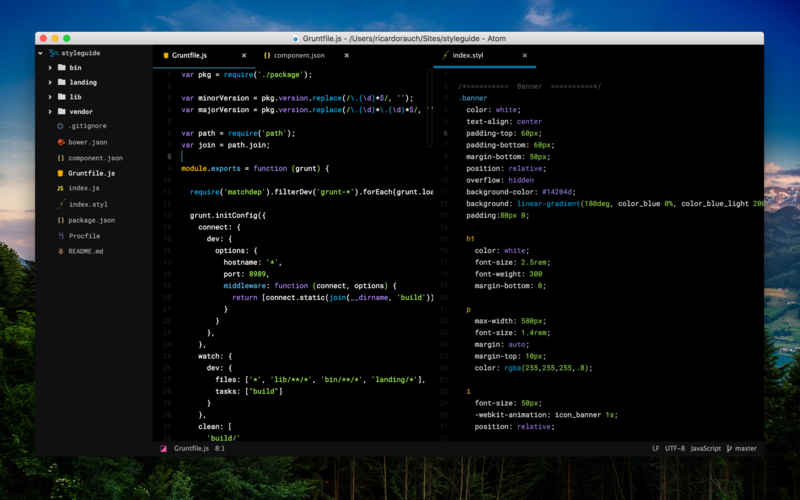 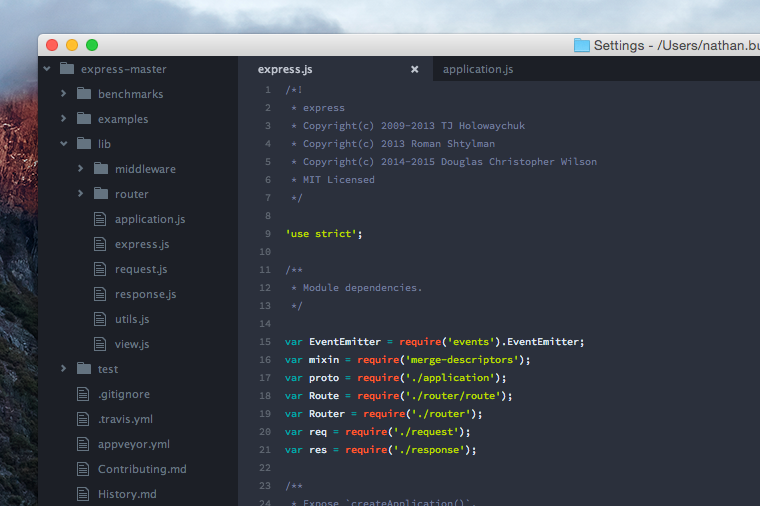 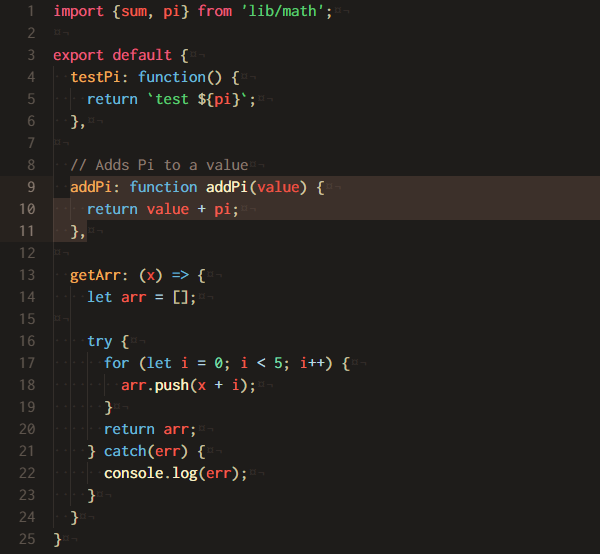 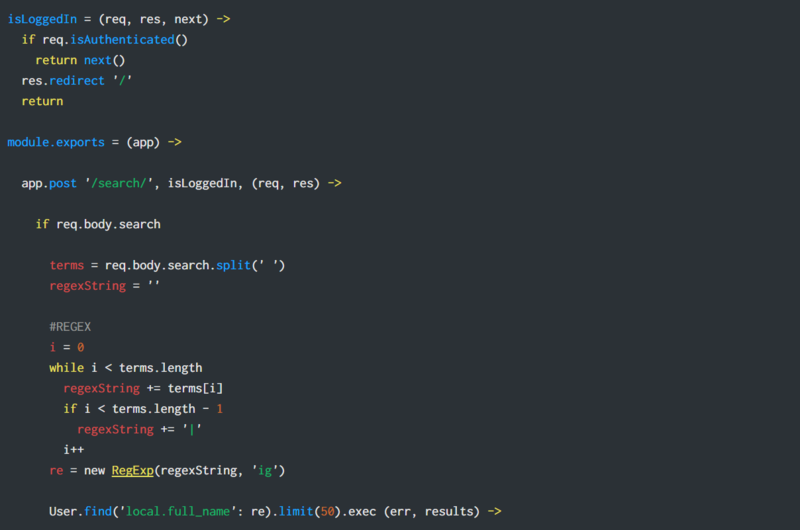 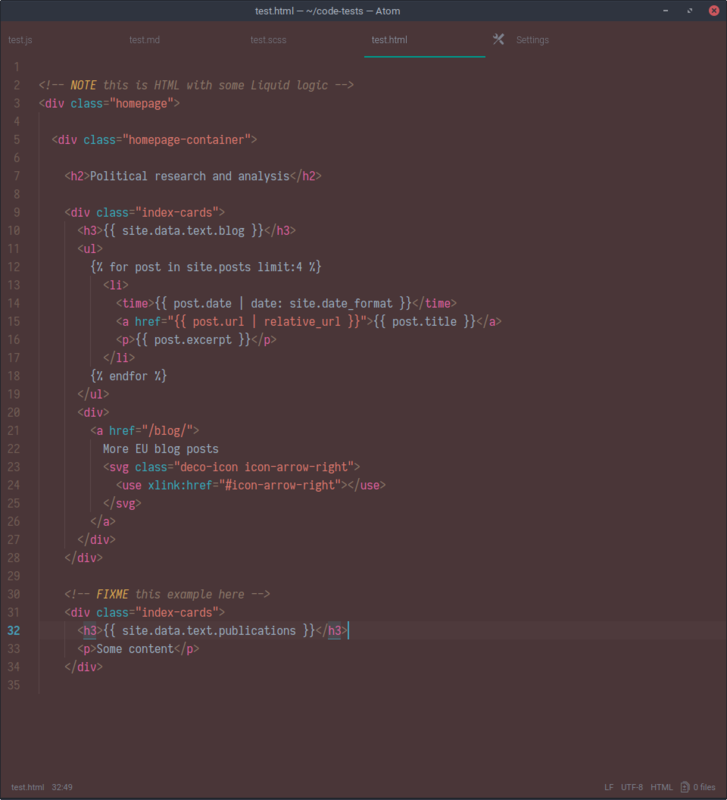 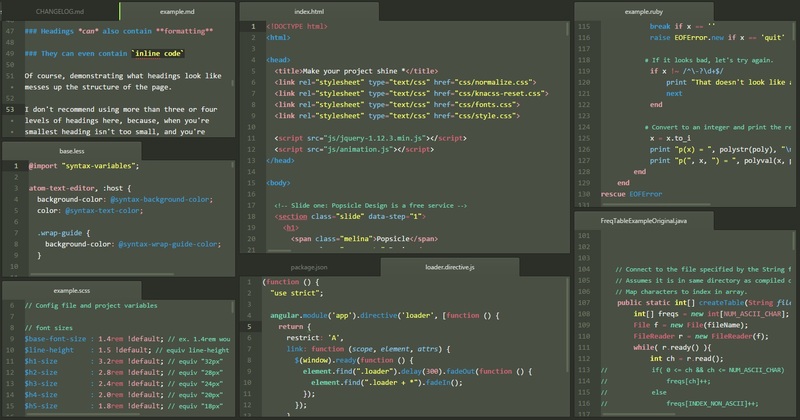 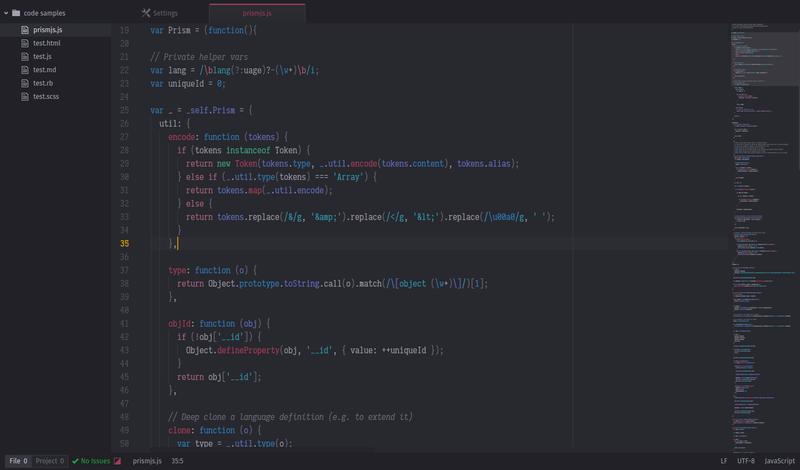 Dark blueish syntax theme with soft colors for atom that’s keen on the eye but stull colorful. 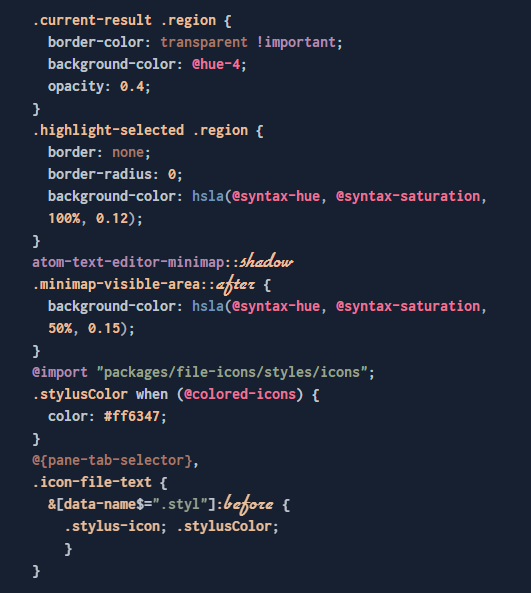 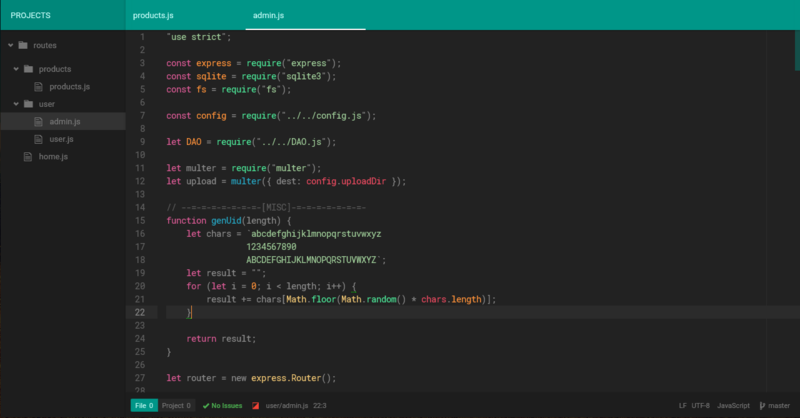 Syntax theme using flashy colors from the 80’s. 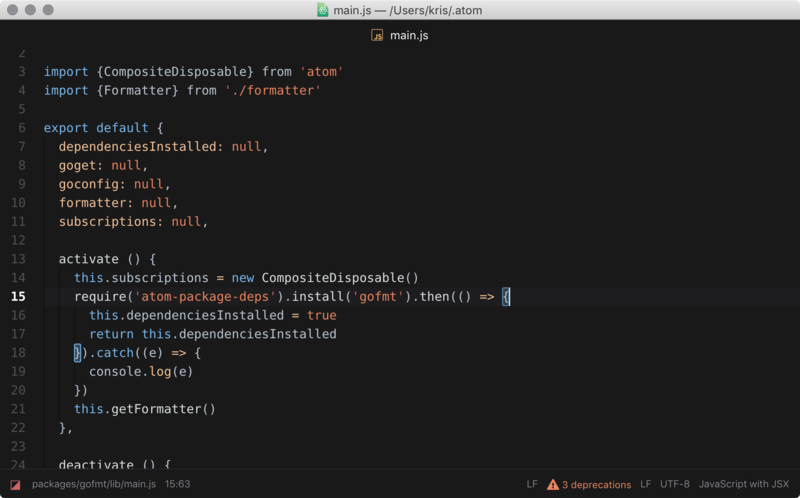 A syntax theme for Atom Material UI. 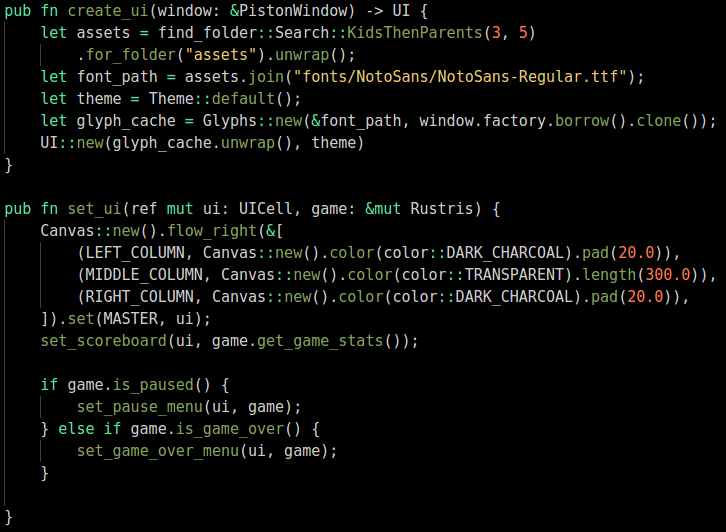 Inspired by silvestreh’s atom-material-syntax. 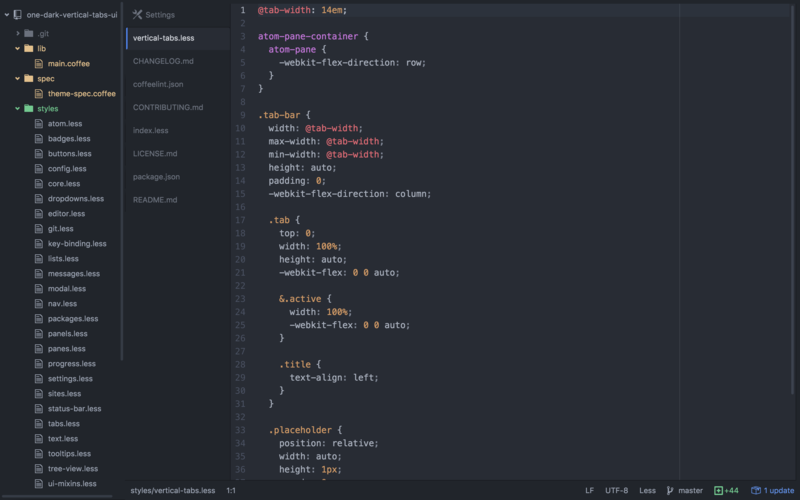 Vive UI Theme for Atom. 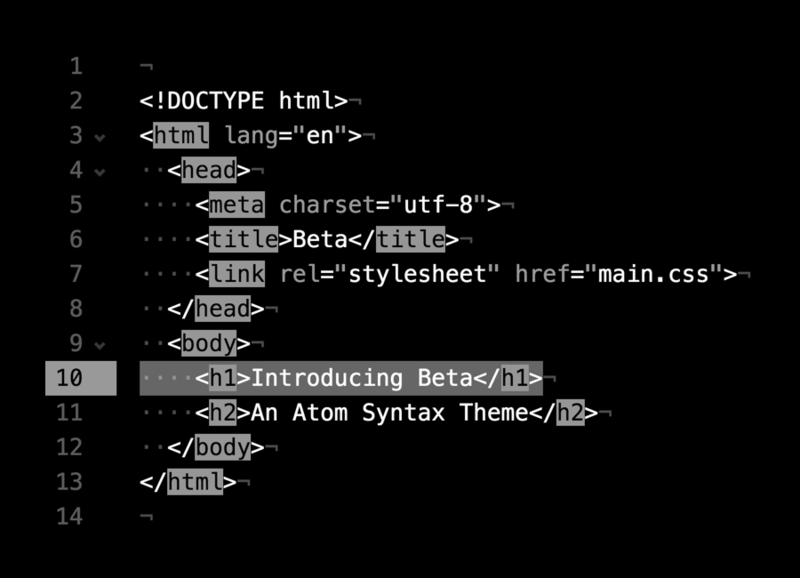 Medium-to-high contrast theme. 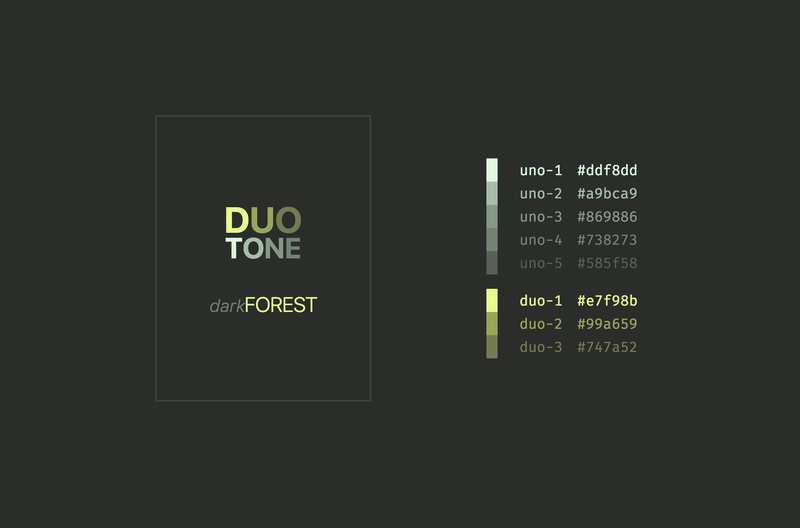 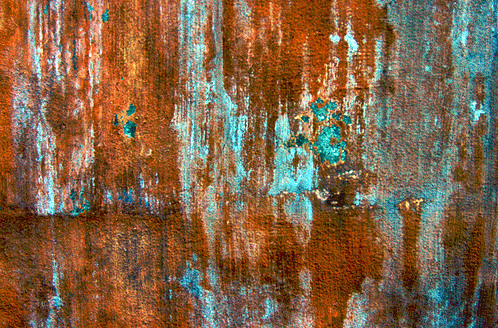 Somewhat ‘generic’, pleasant colours. 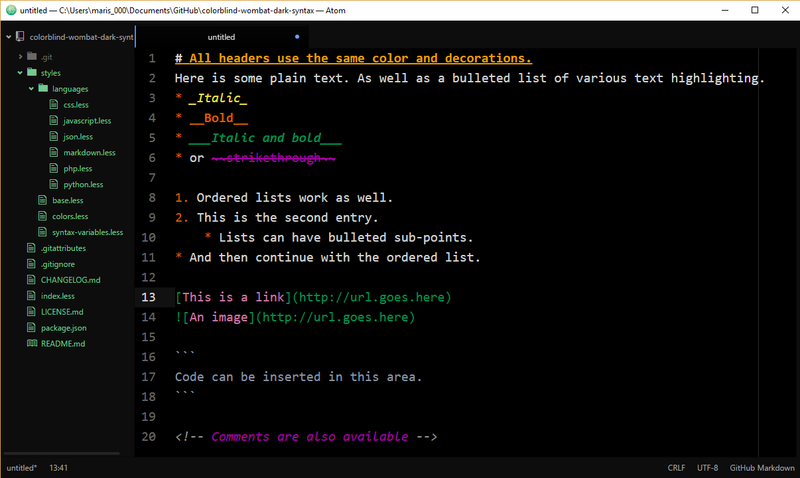 An inverted version of GitHub’s Octocat theme.